Fragile X-associated tremor ataxia syndrome (FXTAS) is a neurodegenerative disorder caused by a CGG trinucleotide repeat expansion in the 5′ UTR of the Fragile X gene, FMR1. FXTAS is thought to arise primarily from an RNA gain-of-function toxicity mechanism. However, recent studies demonstrate that the repeat also elicits production of a toxic polyglycine protein, FMRpolyG, via repeat-associated non-AUG (RAN)-initiated translation. Pathologically, FXTAS is characterized by ubiquitin-positive intranuclear neuronal inclusions, raising the possibility that failure of protein quality control pathways could contribute to disease pathogenesis. To test this hypothesis, this study used Drosophila- and cell-based models of CGG-repeat-associated toxicity. In Drosophila, ubiquitin proteasome system (UPS) impairment leads to enhancement of CGG-repeat-induced degeneration, whereas overexpression of the chaperone protein HSP70 suppresses this toxicity. In transfected mammalian cells, CGG repeat expression triggers accumulation of a UPS reporter in a length-dependent fashion. To delineate the contributions from CGG repeats as RNA from RAN translation-associated toxicity, the production of FMRpolyG in these models was either enhanced or impaired. Driving expression of FMRpolyG enhances induction of UPS impairment in cell models, while prevention of RAN translation attenuates UPS impairment in cells and suppresses the genetic interaction with UPS manipulation in Drosophila. Taken together, these findings suggest that CGG repeats induce UPS impairment at least in part through activation of RAN translation (Oh, 2015). Ubiquitin proteasome system modulation alters CGG-repeat-associated toxicity in Drosophila. Repeat-associated non-AUG (RAN) translation leads to inclusion formation in a Drosophila model of CGG repeat toxicity. The sensitivity of CGG-expressing flies to UPS impairment is determined by their ability to produce the CGG RAN translation product, FMRpolyG. CGG repeats induce impairment of the ubiquitin proteasome system. This study demonstrates that the CGG repeat expansion responsible for the neurodegenerative disorder FXTAS is capable of interacting genetically with modulators of UPS function in Drosophila and of inducing UPS impairment in human cell lines. These processes are largely dependent on RAN translation of the CGG repeat into the polyglycine-containing protein, FMRpolyG. Taken together with previous studies, these findings suggest a model where CGG repeat expansions in FMR1 elicit neuronal proteostasis via RAN translation and contribute to FXTAS pathogenesis (Oh, 2015). Impairment of protein quality control pathways is a common feature among almost all neurodegenerative conditions, including Alzheimer's disease, Parkinson's disease, polyglutamine diseases and ALS/frontotemporal dementia. Together, these conditions have been referred to as neurodegenerative proteinopathies, implying that failures in protein quality control pathways are a proximal shared event in disease pathogenesis and thus a potentially shared route to effective therapeutics. The presence of proteinaceous intranuclear inclusions in FXTAS brains at autopsy suggests that it may similarly be subject to age-dependent decrements in protein quality control and thus share aspects of disease pathogenesis with more common neurodegenerative disorders. However, it was initially unclear how RNA repeats could trigger such a cascade of UPS failure and aggregate formation. The earlier finding that CGG repeats support RAN translation to produce homopolymeric proteins containing polyglycine and (in cell culture models) polyalanine suggests one possible mechanism by which this might occur. Yet, the exact role that these proteins play in UPS impairment and disease pathogenesis is unclear (Oh, 2015). This study provides two important additions to the field. First, it was found that not only are models of FXTAS sensitive to alterations in proteostasis pathways but also that CGG repeat expression is capable of inducing UPS impairment. Second, both the genetic interaction with UPS pathways and the induction of UPS impairment are largely dependent on production of a specific CGG RAN translation product, FMRpolyG. These findings imply that a component of disease pathogenesis that is shared with other neurodegenerative disorders is specifically dependent on RAN translation, implying that future therapeutic development may need to take these products and their toxic consequences into account (Oh, 2015). While the placement of a stop codon just 5′ to the repeat significantly impairs both the genetic interaction of CGG repeat expression with UPS impairment and the induction of UPS impairment in cell culture, it should be noted that it does not completely eliminate the effects of the repeat. This could be the result of at least two possible mechanisms. First, the CGG repeat as RNA may have a direct impact on UPS function. This idea is supported by work in Drosophila on CAG repeats, where placement of these repeats in the 3′ UTR (where its translation should be minimal) elicits phenotypes that are reversible by co-expression of the heat-shock protein HSP-70. Alternatively, the introduced stop codon does not preclude RAN translation in other reading frames. Thus, production of a polyalanine RAN product from the CGG repeats, FMRpolyA, may serve as an alternative trigger for this genetic interaction and UPS impairment. Cell culture observations in this study make this less likely, as driving expression of FMRpolyA causes less induction of UPS failure than similar constructs expressing FMRpolyG. Future studies will be needed to determine the potential roles of both FMRpolyA and the CGG repeat as RNA in UPS impairment and FXTAS pathogenesis (Oh, 2015). In animal models of many neurodegenerative disorders, treatment with agents that augment protein quality control pathways can ameliorate neuronal toxicity and behavioral phenotypes, suggesting a role for targeting this pathway in disease therapeutics. In this study, a Drosophila model of FXTAS was treated with rapamycin, a drug that augments autophagy and suppresses polyglutamine toxicity in multiple model systems. Surprisingly, it was found that rapamycin has no beneficial effects and in fact has a trend toward enhancing toxicity. Moreover, no genetic interaction with autophagy impairment was observed. These results are consistent with previously published studies. This suggests that the CGG RAN-translated products interact specifically with the UPS, making them somewhat separate from other toxic proteins. However, it may be that other effects of mTOR impairment explain the lack of suppression in CGG repeat models compared with polyglutamine disorders that explain this finding. Indeed, activation of mTOR can suppress some CGG repeat phenotypes in Drosophila (Oh, 2015). Recent work by other groups demonstrates that RAN translation contributes significantly to toxicity elicited by the GGGGCC repeat expansion in cell- and Drosophila-based models. However, it remains unclear whether the translational initiation mechanisms and behavior of FMRpolyG are directly comparable with the dipeptide repeat proteins generated from hexanucleotide repeat expansions. Early results suggest that each RAN translation product is likely to elicit both non-specific repeat-mediated proteotoxicity coupled with repeat-specific toxicity mediated through protein–protein interactions and perhaps sequestration of specific factors. However, at least one recent study demonstrates that application of drugs which bind to both CGG and GGGGCC repeat mRNAs impair RAN translation in cellular models. Evaluating these types of compounds in vivo should assist us in evaluating the broader impact of RAN translation on disease pathogenesis and provide a model for therapeutic development (Oh, 2015). Fragile X syndrome (FXS) patients present neuronal alterations that lead to severe intellectual disability, but the underlying neuronal circuit mechanisms are poorly understood. An emerging hypothesis postulates that reduced GABAergic inhibition of excitatory neurons is a key component in the pathophysiology of FXS. This idea was directly tested in a FXS Drosophila model. FXS flies were shown to exhibit strongly impaired olfactory behaviors. In line with this, olfactory representations are less odor specific due to broader response tuning of excitatory projection neurons. Impaired inhibitory interactions were found to underlie reduced specificity in olfactory computations. Finally, defective lateral inhibition across projection neurons was shown to be caused by weaker inhibition from GABAergic interneurons. Direct evidence is provided that deficient inhibition impairs sensory computations and behavior in an in vivo model of FXS. Together with evidence of impaired inhibition in autism and Rett syndrome, these findings suggest a potentially general mechanism for intellectual disability (Franco, 2017). Fragile X syndrome (FXS) is a common inherited intellectual disability disorder. FXS patients exhibit neurological symptoms that include learning disabilities, social anxiety, attention deficits, hyperarousal, hypersensitivity, autism, and epilepsy. Notwithstanding the complexity of neurophysiological and behavioral alterations, FXS is caused by the silencing, deletion, or loss-of-function mutation of a single gene, FMR1. As a result, FMRP (fragile X mental retardation protein), its protein product, is not expressed in the majority of cases or is non-functional in the rare cases with a point mutation. FMRP is an mRNA-binding protein that regulates several aspects of mRNA metabolism such as nuclear export, transport to synaptic terminals, activity-dependent ribosome stalling and gene expression. Although much of FMRP activity is thought to be related to regulation of synaptic function, little is known about the potential defects in neuronal function caused by the absence of FMRP, in particular how these neurophysiological alterations lead to impairment in neuronal computations and behavior in patients with FXS (Franco, 2017). Initial studies revealed that dendritic spine number is increased in the cortex of FXS patients. In fact, dendritic abnormalities are the most consistent anatomical correlates of intellectual disability. Studies on animal models of FXS showed that FMRP regulates neuronal branching as well as dendritic spine morphology and density. In addition to defects in synaptic structure and axonal branching, impairments in animal behavior have been observed. However, further studies showed that neuroanatomical and behavioral defects can be genetically uncoupled, suggesting that unknown impairments in neuronal circuit function may underlie behavioral deficits (Franco, 2017). FMRP regulates translation of mRNAs at synapses, some of which encode proteins involved in synaptic plasticity. Importantly, the absence of FMRP leads to abnormally enhanced group 1 mGluR (metabotropic glutamate receptor) signaling, which results in exaggerated long-term depression, with a net loss of AMPA and NMDA receptors. Additionally, enhanced group 1 mGluR signaling contributes to the elongation of dendritic spines in rodent models of FXS and leads to increased intrinsic neuronal excitability through the downregulation of potassium channels controlling resting membrane potential and action potential afterhyperpolarization. Moreover, FMRP directly influences neuronal excitability by regulating expression of potassium channels and by interacting with potassium channels in a translation-independent manner. Nevertheless, the recent failure of FXS clinical trials targeting group 1 mGluR signaling has led the field to re-examine the group 1 mGluR hypothesis (Franco, 2017). Loss of FMRP was shown to increase network-level hyperexcitability in the rodent cortex, which has been associated with the symptoms observed in FXS patients, such as hypersensitivity, hyperarousal, hyperactivity, anxiety, and epilepsy. Interestingly, absence of FMRP downregulates GABAA receptor subunits in both mice and flies. Furthermore, the enzymes for GABA synthesis and degradation, GABA membrane transporters, a GABA receptor scaffolding protein, and a protein that regulates GABAB receptor signaling are downregulated in the absence of FMRP. These observations suggest a tantalizing, yet poorly understood, link between GABAergic signaling, network hyperexcitability, and behavioral deficits in FXS models and patients (Franco, 2017). In contrast to the group 1 mGluR component of FXS, the potential effects of altered synaptic inhibition on neuronal circuit excitability and how these changes might impact sensory computations and animal behavior remain unexplored. This study explored the changes in neuronal circuit function and connectivity underlying FXS by using a combination of behavioral assays, functional brain imaging, optogenetics, and electrophysiology in a fly FXS model. Focus was placed on the Drosophila melanogaster olfactory system, which is a well-understood and genetically tractable neuronal circuit. Specifically, olfactory computations were evaluated in the antennal lobe, a circuit constituted by excitatory projection neurons, which receive synaptic input from their cognate olfactory receptor neurons, as well as inhibitory local interneurons involved in mediating lateral inhibition (Franco, 2017). The absence of dFMRP, the fly homolog of the human FMRP, was found to result in reduced olfactory attraction and aversion. Calcium imaging data show that antennal lobe projection neurons have broader odor tuning in dfmr1- flies, leading to reduced specificity in odor coding and alterations in olfactory representations. Consistent with these results, lateral inhibition was observed across olfactory glomeruli, as well as the inhibitory connections between local interneurons and projection neurons, are impaired in dfmr1- flies. Finally, downregulation of GABA receptors in projection neurons is sufficient to produce olfactory behavioral defects. It is proposed that absence of dFMRP leads to defective lateral inhibition across olfactory glomeruli, which, in turn, results in impaired odor coding and olfactory behaviors (Franco, 2017). Since the discovery of reduced GABAA receptor subunit expression in the absence of FMRP, accumulated evidence has pointed toward alterations in GABAergic transmission as a key component in the neurophysiology of FXS. In fact, intracellular recordings on acute brain slices suggested that reduced inhibitory input from interneurons onto pyramidal neurons could result in an excitation/inhibition imbalance. Whether this is true in vivo and how it might impact neuronal circuit function and behavior remained unclear (Franco, 2017). This was tested using the fruit fly antennal lobe circuit; GABAergic connections established by local interneurons, which mediate lateral inhibition, were found to be impaired in a Drosophila melanogaster model of FXS. Moreover, it was shown that deficits in GABAergic lateral inhibition leads to increased circuit excitability, which results in reduced stimulus selectivity in projection neurons. With lower selectivity comes impaired olfactory computations leading to strong odor discrimination deficits. It is postulated that similar deficits in lateral inhibition impair neuronal computations in other sensory modalities. In consonance with this, it has been reported that circuit hyperexcitability leads to behavioral alterations in tactile, auditory, and olfactory tasks in mouse models of FXS (Franco, 2017). The results indicate that, in the absence of dFMRP, neuronal computations are impaired in the antennal lobe of Drosophila. Consequently, flies exhibit deficits in olfactory behaviors. This is in apparent contradiction with a previous study showing long-term memory defects in dfmr1- flies and no sensory deficits. Responses to many odors are still elicited in projection neurons of dfmr1- flies. They are just less selective due to reduced lateral inhibition. It is suggested that this difference may be due to a more extensive and quantitative analysis of behavior and physiology in this study that revealed defects that may have not been previously detected. Alternatively, the penetrance and severity of phenotypes in FMR1 mutant animals, both mice and flies, can be sensitive to genetic background. It is possible that the previous study did not account for this. At any rate, both null alleles and RNAi flies analyzed using behavioral, imaging, and electrophysiological approaches revealed that dfmr1 mutants exhibit reduced odor specificity and, thus, deficient olfactory processing (Franco, 2017). Lateral inhibition across Drosophila olfactory glomeruli has been proposed to be important for increasing contrast among odor representations and, therefore, for discriminating odors. Interestingly, such a mechanism has been suggested to be relevant for other sensory modalities. In this winner-take-all model, glomeruli with most prominent odor responses would strongly activate surrounding interneurons, spreading inhibition to nearby weakly activated glomeruli. The spread of lateral inhibition, in turn, would inhibit the odor responses of weakly activated glomeruli, while strongly activated glomeruli remain as the unique encoder of the particular odor. This model also suggests that the lack of many weakly activated glomeruli, in addition to few strongly responding but very odor-specific glomeruli, enhances the separation of odor response patterns from one another. In line with this model, it was observed that lack of lateral inhibition in the antennal lobe of dfmr1- flies, indeed, leads to an increase in the number of weakly activated and less odor-specific glomeruli. By contrast, WT flies present more inhibitory and less weak excitatory responses, sparing strongly responding olfactory glomeruli that are more odor specific. This is probably a consequence of reduced lateral inhibition, which is important for contrast enhancement of odor representations. Additionally, the slight decrease in lateral excitation observed in dfmr1- flies could result in less strongly represented glomeruli. Importantly, defects in olfactory processing have been observed in other animal models of FXS, as well as in human patients, which display hypersensitivity to smells and to other sensory modalities involving lateral inhibitory mechanisms such as tactility and audition (Franco, 2017). Beyond the olfactory system, several studies have shown that CNS neurons are hyperexcitable in the absence of FMRP. Since activation of the group 1 mGluR signaling pathway results in increased neuronal excitability, circuit hyperexcitability has been attributed to the constitutively enhanced group 1 mGluR signaling observed in mouse FXS models. This study provides the first direct in vivo evidence showing that defects in lateral GABAergic inhibition significantly contribute to circuit hyperexcitability. This is consistent with downregulation of proteins involved in GABAergic transmission both in fruit flies and in rodents. Thus, reduced inhibition could be a consequence of decreased GABA release from local interneurons, reduced expression of postsynaptic GABA receptors, or both. Further studies of protein expression profiles for the specific neuron types are needed to elucidate this. It is possible that this mechanism might explain phenotypes observed in FXS patients such as hypersensitivity, hyperarousal, hyperactivity, and epilepsy, all of which reflect hyperexcitable brain states (Franco, 2017). In summary, this study demonstrates that lateral inhibition within the antennal lobe is strongly affected in dfmr1- flies due to impaired inhibitory connections from local interneurons onto projection neurons and other local interneurons. The lack of this lateral inhibition on projection neurons is probably the major cause for their increased excitability and reduced odor specificity. It is proposed that this compromised olfactory coding consequently leads to impaired olfactory behaviors in dfmr1- flies. More generally, this study provides the missing in vivo evidence that the lack of dFMRP has a direct impact on sensory processing and animal behavior through a weakening of lateral inhibitory connections, which broadens response tuning of principal neurons. This mechanism might be ubiquitously present in the brain of FXS patients. For instance, reduced GABAergic inhibition could produce hyperexcitable neuronal circuits in FXS patients, which not only explains symptoms such as hypersensitivity, hyperarousal, or epilepsy but also potentially contributes to the misprocessing of information across the brain, which would have severe effects on human behavior. Finally, given the overlap between the phenotypes of FXS and those of other neurological diseases, such as autism, Rett syndrome, or Dravet syndrome, and their corresponding perturbations in GABAergic transmission, it is possible that similar mechanisms involving reduced lateral inhibition are also present in these neurological syndromes, which are yet to be discovered (Franco, 2017). Fragile X syndrome (FXS) is the most common cause of heritable intellectual disability and autism and affects ~1 in 4000 males and 1 in 8000 females. The discovery of effective treatments for FXS has been hampered by the lack of effective animal models and phenotypic readouts for drug screening. FXS ensues from the epigenetic silencing or loss-of-function mutation of the fragile X mental retardation 1 (FMR1) gene, which encodes an RNA binding protein that associates with and represses the translation of target mRNAs. Previous studies found that the activation of LIM kinase 1 (LIMK1) downstream of augmented synthesis of bone morphogenetic protein (BMP) type 2 receptor (BMPR2) promotes aberrant synaptic development in mouse and Drosophila models of FXS and that these molecular and cellular markers were correlated in patients with FXS. This study reports that larval locomotion is augmented in a Drosophila FXS model. Genetic or pharmacological intervention on the BMPR2-LIMK pathway ameliorated the synaptic abnormality and locomotion phenotypes of FXS larvae, as well as hyperactivity in an FXS mouse model. This study demonstrates that (1) the BMPR2-LIMK pathway is a promising therapeutic target for FXS and (2) the locomotion phenotype of FXS larvae is a quantitative functional readout for the neuromorphological phenotype associated with FXS and is amenable to the screening novel FXS therapeutics (Kashima, 2017). Behavioral manifestations in the Drosophila FXS model have been reported and include abnormal crawling and locomotion of third-instar larvae. This study developed quantitative behavioral assays that showed that reduction of Wit gene dosage in dFMR1 mutant larvae reverts the locomotion phenotype and that oral administration of LIMK antagonists and a protein synthesis inhibitor restores normal crawling velocity and reduces NMJ bouton numbers. It was also confirmed that administration of a LIMK antagonist in the mouse FXS model rescues the rodent behavioral abnormalities. Thus, this study demonstrates that (1) the locomotion phenotype in dFMR1 mutant larvae serves as a readout of NMJ bouton phenotype; (2) the larval crawling assay system that was developed can be used for the genetic or chemical screening of therapeutic molecules for FXS as well as other synapse formation abnormalities; and (3) targeting the LIMK1 pathway, which is conserved from Drosophila to human, is a potential therapeutic strategy for FXS (Kashima, 2017). In Drosophila, glass bottom boat (Gbb), which is produced by the postsynaptic muscle, binds to the presynaptic receptor Wit and plays a critical role in modulating neuromuscular synaptic growth, stability, and function. Upon Gbb binding, Wit forms a heteromeric receptor complex with Thickveins (Tkv) and Saxophone (Sax), which then phosphorylate Mothers against decapentaplegic (MAD), a Drosophila homolog of Smad1/5/8. It has been reported that loss of Spartin, a Drosophila homolog of SPG20 that promotes endocytotic degradation of Wit and represses the BMP-Wit signaling pathway, results in an increment of neuromuscular synapses. The result with the dFMR1Δ113/+ mutant is consistent with the Spartin study and confirms the effect of increased Gbb-Wit signal on abnormal synapse development. Loss-of-expression mutants of Spartin develop age-dependent and progressive neuronal defects resembling hereditary spastic paraplegia (HSP). Because frameshift mutations in the SPG20 gene cause a form of HSP known as Troyer syndrome (Online Mendelian Inheritance in Man no. 275900), these results underscore the significance of a presynaptic BMP signal finely tuned by multiple regulatory molecules, including SPG20 and FMRP, for proper motor neuron development and function. Beyond the domain of the NMJ, multiple studies reinforce the notion that the correct intensity and spatiotemporal dynamics of the BMP signaling pathway are critical for axon regeneration upon neuronal and glial injury responses after CNS injury. Furthermore, BMP signaling specifies large and fast-transmitting synapses in the auditory system in a process that largely shares homologies with retrograde BMP signaling in Drosophila neuromuscular synapses. In line with these findings, the current results propose an essential role for the FMRP-BMPR2 axis in the development of the neuropathology of patients with FXS (Kashima, 2017). The major obstacle against the development of drugs for neurodevelopmental and neurodegenerative diseases is the lack of proper animal models that recapitulate the range of intellectual disability and/or cognitive dysfunction found in human patients. The existing, inadequate models also lack quantitative and reproducible assays to examine cognitive phenotypes. The mouse model of FXS exhibits cognitive and behavioral phenotypes that are both consistent and inconsistent with the symptoms of patients with FXS. For example, a frequent FXS trait is a high-anxiety behavior, whereas the FMR1-KO mice exhibit lower anxiety-like behaviors in the 'light-dark compartment' test. Furthermore, the result of the OFT is confusing because the FMR1-KO mice tend to spend a longer period in the center. The number of crossings and their velocity are both augmented compared to control mice because of their hyperactivity, but this behavior is interpreted as lower anxiety-like. The results of the 'elevated plus maze (EPM)' test, which is frequently used to investigate anxiety-like behaviors in FXS mice, exhibit both a decrease and an increase in anxiety. Furthermore, the tests show great variability and, sometimes, opposing outcomes in behavior depending on the genetic background of the mice, for example, FVB versus C57BL/6J. Considering the variability and lack of reproducibility of behavioral test results in FMR1-KO mice, as well as the concerns of animal welfare and the cost of husbandry, there is a strong need for an animal model and phenotypic readout to screen for FXS drugs (Kashima, 2017). 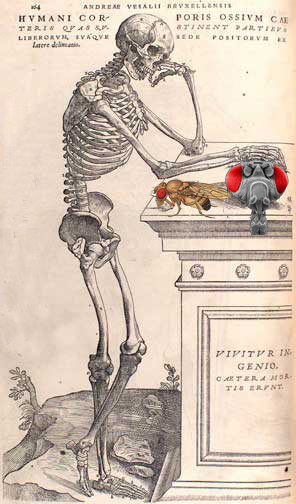 There are multiple advantages of the Drosophila FXS model over the rodent models. Flies are invertebrates, which are inexpensive and easily cared for. They have a shorter life span and produce numerous externally laid embryos than rodent models. Their genome is small, minimally redundant, and easy to genetically manipulate in a tissue-specific manner. It is easy to orally administer drugs to larvae by adding compounds to the Drosophila medium Formula 4-24 (Carolina Biological Supply Company). Previously, small molecules had to be delivered through conventional fly food that requires boiling followed by the addition of propionic acid, which disables the effect of heat- or acid-sensitive molecules. The use of Formula 4-24, which can be dissolved in water at room temperature and does not require exposure to high temperature nor addition of acid, expands the range of molecules that can be delivered to larvae without loss of activity (Kashima, 2017). Drosophila has contributed extensively to the discovery and validation of drug targets, as well as to the mechanistic understanding of their genetic cause. In the context of FXS studies, it has been reported that dFMR1 adult mutant flies exhibit defects in learning/memory assays, such as Pavlovian olfactory association and courtship conditioning. These behavioral abnormalities can be restored by various compounds known to target different FMRP targets, including protein synthesis inhibitors, such as puromycin and cycloheximide, the metabotropic glutamate receptor 5 antagonist MPEP, γ-aminobutyric acid agonists, phosphodiesterase-4 inhibitor, and glycogen synthase kinase 3 inhibitor. The current study demonstrates that several dFMR1 mutant larvae exhibit an abnormally high number of NMJ synaptic boutons that correlate with their locomotion abnormality. Both are reversed by LIMK-i treatment, similarly to the effect of this drug in the FMR1-KO mouse. Thus, the crawling assay in dFMR1 mutant Drosophila larvae is proposed as a rapid, quantitative, and reproducible preclinical screening strategy for potential FXS therapies that is alternative to behavioral tests using dFMR1 adult mutant flies or vertebrate FXS models. To facilitate the transition to a high-throughput screen of FXS drugs, the current assay will benefit from an improvement in the number of larvae that can be simultaneously assessed and in the robustness of the phenotype of dFMR1Δ113/+ mutants (Kashima, 2017). Larval locomotion abnormalities are described in Drosophila models of CNS diseases, such as Alzheimer's and Huntington's. It has been reported that a different strain of dFMR1 mutant Drosophila larvae (dFMR14) exhibits frequent turnings compared to wild-type larvae. This study observed that various dFMR1 mutants, including dFMR1Δ113/+, dFMR1Δ50/+, dFMR13/+, and dFMR1Δ113/3, as well as the dFMR1-RNAi line, crawled from the center to the periphery in a linear manner with an enhanced velocity compared to wild-type larvae. It is speculated that this discrepancy might be due to the different nature of the mutations. For example, dFMR1Δ113 harbors a deletion of the first three exons of the dFMR1 gene, including exon 3 that contains the translation initiation methionine. Consequently, the dFMR1Δ113 allele results in a loss of dFMRP. On the contrary, the dFMR14 allele has a replacement of amino acid 289 with a stop codon; hence, it expresses a partial dFMRP missing the C terminus. Furthermore, in the process of creating the dFMR14 mutant, a Gal4-binding site was inserted into the first intron between exons 1 and 2 of the dFMR1 gene to overexpress a truncated dFMRP upon coexpression of Gal4 transcription factor. These differences might explain the distinct larval crawling behavior of the dFMR1Δ113 and dFMR14 mutants. The homozygous dFMR1Δ50 and homozygous dFMR13 mutants are viable and develop into adulthood similarly to the homozygous dFMR14 mutant. The homozygous dFMR1Δ50 and homozygous dFMR13 mutants exhibited frequent turns in the locomotion assay similar to a previous study of the homozygous dFMR14 mutant. The velocity of dFMR13 and dFMR1Δ50 homozygous mutants was slower than wild-type, presumably because of the frequent changes of direction, unlike the transheterozygous dFMR1Δ113/3 mutant, which crawled in a linear fashion with an augmented velocity. It is speculated that the turning phenotype observed in the homozygous mutants is due to complete loss of dFMRP, affecting the CNS neurons. FMRP activity has already been shown to be important for CNS neuron development and function in Drosophila (Kashima, 2017). Performing the locomotion assay with larvae instead of adults is beneficial as they present an accessible, anatomically simple, and well-described peripheral nervous system (for example, NMJ boutons), which allows the molecular and biochemical assessment of the mechanism underlying the locomotion dysfunction and the therapeutic effects of drugs. For chemical screens of known pathways or targets, the NMJ synapses of larvae that exhibit an altered crawling phenotype should be subjected to synaptic bouton phenotype analysis as well as biochemical investigation to rapidly validate the 'on-target' and eliminate the 'off-target' effects of the candidate molecules. A Drosophila larvae locomotion assay has been proposed as a way to screen drugs for neurodegenerative diseases, such as Alzheimer's disease. They subjected Drosophila larvae expressing the human three-repeat tau gene in motor neurons to crawling assays, such as a five-lane assay and a four-plate open-field assay, video-recorded the locomotion with an Ikegami digital video camera and a 5-mm digital video camera lens, and analyzed locomotion using EthoVision 3.0 software. In comparison, the advantage of the current strategy is that the assay does not require specialized equipment, but a common video recording device, such as an iPhone camera, and an algorithm that is accessible and free to the scientific community. Furthermore, the system can simultaneously track and assess the crawling activities of multiple larvae through the open-access algorithm LarvaTrack, which was developed to trace and measure larval crawling activity. Up to 15 larvae have been simultaneously assessed using a 15-cm agarose plate. The method can be easily adapted to a larger number of larvae by using a larger agarose plate to avoid larvae to cross paths during crawling. Thus, the semiautomated assay of locomotion behavior described in this study can allow the higher-throughput assay that is essential for the screen of candidate molecules. In conclusion, activation of the FMRP-BMPR2 axis plays a role in synaptic abnormalities in both mouse and Drosophila models of FXS. The larval crawling assay is an easy, fast, and well-suited medium-throughput screen for genetic or chemical modulators of locomotion dysfunction in the Drosophila FXS model, which can be further evaluated in cognitive and behavioral tests using mammalian FXS models (Kashima, 2017). Several off-label studies have shown that acamprosate, a modulator of AMPA and GABAA receptors, can provide some clinical benefits in youth with Fragile X Syndrome (FXS), an autism spectrum disorder caused by loss of function of the highly conserved FMR1 gene. This study investigated the ability of acamprosate to rescue cellular, molecular and behavioral defects in the Drosophila model of FXS. A high (100mμM) and low (10mμM) dose of acamprosate was fed to Drosophila FXS (dfmr1 null) or genetic control (w1118) larvae and then analyzed in multiple paradigms. A larval crawling assay was used to monitor aberrant FXS behavior, overgrowth of the neuromuscular junction (NMJ) was quantified to assess neuronal development, and quantitative RT-PCR was used to evaluate expression of deregulated Calbindin 53E cbp53E mRNA. Acamprosate treatment partially or completely rescued all of the FXS phenotypes analyzed, according to dose. High doses rescued cellular overgrowth and dysregulated cbp53E mRNA expression, but aberrant crawling behavior was not affected. Low doses of acamprosate, however, did not affect synapse number at the NMJ, but could rescue NMJ overgrowth, locomotor defects, and cbp53E mRNA expression. This dual nature of acamprosate suggests multiple molecular mechanisms may be involved in acamprosate function depending on the dosage used. Acamprosate may be a useful therapy for FXS and potentially other autism spectrum disorders. However, understanding the molecular mechanisms involved with different doses of this drug will likely be necessary to obtain optimal results (Hutson, 2018). Mutations in the fragile X mental retardation 1 gene (FMR1) cause the most common inherited human autism spectrum disorder. FMR1 influences messenger RNA (mRNA) translation, but identifying functional targets has been difficult. This study analyzed quiescent Drosophila oocytes, which, like neural synapses, depend heavily on translating stored mRNA. Ribosome profiling revealed that FMR1 enhances rather than represses the translation of mRNAs that overlap previously identified FMR1 targets, and acts preferentially on large proteins. Human homologs of at least 20 targets are associated with dominant intellectual disability, and 30 others with recessive neurodevelopmental dysfunction. Stored oocytes lacking FMR1 usually generate embryos with severe neural defects, unlike stored wild-type oocytes, which suggests that translation of multiple large proteins by stored mRNAs is defective in fragile X syndrome and possibly other autism spectrum disorders (Greenblatt, 2018). Sensory processing dysfunction (SPD) is present in most patients with intellectual disability (ID) and autism spectrum disorder (ASD). Silencing expression of the Fragile X mental retardation 1 (FMR1) gene leads to Fragile X syndrome (FXS), the most common single gene cause of ID and ASD. Drosophila have a highly conserved FMR1 ortholog, dfmr1. dfmr1 mutants display cognitive and social defects reminiscent of symptoms seen in individuals with FXS. This study utilized a robust behavioral assay for sensory processing of the Drosophila stress odorant (dSO) to gain a better understanding of the molecular basis of SPD in FXS. This study shows that dfmr1 mutant flies present significant defects in dSO response. dfmr1 expression in mushroom bodies was found to be required for dSO processing. It was also shown that cyclic adenosine monophosphate (cAMP) signaling via PKA is activated after exposure to dSO and that several drugs regulating both cAMP and cyclic guanosine monophosphate (cGMP) levels significantly improved defects in dSO processing in dfmr1 mutant flies (Androschuk, 2018). The protein complex formed by the Ca2+ sensor neuronal calcium sensor 1 (NCS-1) and the guanine exchange factor protein Ric8a (see Drosophila Ric8) coregulates synapse number and probability of neurotransmitter release, emerging as a potential therapeutic target for diseases affecting synapses, such as fragile X syndrome (FXS), the most common heritable autism disorder. Using crystallographic data and the virtual screening of a chemical library, this study identified a set of heterocyclic small molecules as potential inhibitors of the NCS-1/Ric8a interaction. The aminophenothiazine FD44 interferes with NCS-1/Ric8a binding, and it restores normal synapse number and associative learning in a Drosophila FXS model. The synaptic effects elicited by FD44 feeding are consistent with the genetic manipulation of NCS-1. The crystal structure of NCS-1 bound to FD44 and the structure-function studies performed with structurally close analogs explain the FD44 specificity and the mechanism of inhibition, in which the small molecule stabilizes a mobile C-terminal helix inside a hydrophobic crevice of NCS-1 to impede Ric8a interaction. This study shows the drugability of the NCS-1/Ric8a interface and uncovers a suitable region in NCS-1 for development of additional drugs of potential use on FXS and related synaptic disorders (Mansilla, 2017). Stem cell maintenance is essential for the generation of cells with high rates of renewal, such as blood and intestinal cells, and for the regeneration of many organs such as the brain and skin. Previous work has shown that Zfrp8 is essential for maintaining hematopoietic, follicle, and germline stem cells (GSCs) in Drosophila melanogaster. Knockdown (KD) of Zfrp8 in GSCs results in the loss of stem cell self-renewal, followed by the eventual loss of all germline cells. Similarly in vertebrates, the Zfrp8 homolog, Pdcd2, is essential for embryonic stem cell maintenance and the growth of mouse embryonic fibroblasts; Pdcd2 mouse embryos die before implantation. PDCD2 is abundantly expressed and essential in highly proliferative cells including cultured cells and clinical isolates obtained from patients with hematologic malignancies. The function of Zfrp8 and PDCD2 is highly conserved, as expression of transgenic PDCD2 is sufficient to rescue Zfrp8 phenotypes. Zfrp8 directly binds to Ribosomal Protein 2 (RpS2), a component of the small ribosomal subunit (40S), controls its stability and localization, and hence RNA processing. Zfrp8 also interacts with the piRNA pathway, which is conserved throughout all metazoans and is also essential for the maintenance of GSCs (Tan, 2016). The piRNA pathway functions in maintaining heterochromatin stability and regulating the expression levels of retrotransposons. Both processes are thought to occur through piRNA targeting of chromatin modifying factors to the DNA. Guided by piRNAs, the piRNA pathway protein Piwi and associated proteins can set repressive epigenetic modifications to block transcription of nearby genes. Levels of transposon transcripts are also controlled by cytoplasmic PIWI-piRNA complexes, which can bind complementary mRNAs and mark them for translational repression and degradation (Tan, 2016). Fragile-X Mental Retardation Protein (FMRP) functions as a translational repressor involved in RNA silencing. FMRP is a Piwi interactor and part of the piRNA pathway. FMRP-deficient animals display phenotypes similar to piRNA pathway mutants including genomic instability and de-repression of retrotransposons. While FMRP is predominantly localized within the cytoplasm, FMRP complexes have also been demonstrated within the nucleus. In Xenopus, FMRP has been shown to bind target mRNAs co-transcriptionally in the nucleus. Like Zfrp8, FMRP has been shown to bind ribosomal proteins prior to nuclear export. In the cytoplasm, the FMRP-containing RNP complex controls mRNAs stability, localization, and miRNA-dependent repression. FMRP mRNA targets are not well defined, as different studies show low overlap of putative targets in neuronal tissues (Tan, 2016). In Drosophila, FMRP is required to maintain GSCs, and loss of Fmr1 is associated with infertility and developmental defects in oogenesis and neural development. Fmr1, the gene encoding FMRP, is essential in both vertebrates and Drosophila for the maintenance of neural stem cells (NSCs). In humans, loss of FMRP is associated with Fragile X-associated disorders, which cover a spectrum of mental, motor, and reproductive disabilities. Fragile X-associated disorders are the most commonly inherited cause of mental disabilities and autism. In vertebrates, FMRP physically interacts in the nucleus with NUFIP1 (Nuclear FMRP-Interacting Protein 1), a nucleo-cytoplasmic shuttling protein involved in ribonucleoprotein (RNP) complex formation. NUFIP1 is found in the nucleus in proximity to nascent RNA, and in the cytoplasm associated with ribosomes. In the cytoplasm, FMRP co-localizes and associates with Trailer Hitch (Tral) to form a translational repressor complex. The Tral complex contains a number of translational repressor proteins, which together control the initiation of translation and the stability of mRNAs, such as gurken (grk). In Drosophila, loss of Tral causes ovary phenotypes similar to piRNA pathway mutants, including oocyte polarity defects and transposon activation (Tan, 2016). This study has identified Zfrp8 interactors by performing a yeast-two hybrid screen, and also by analyzing the components of the Zfrp8 complex by mass spectrometry. The nature of the proteins in the Zfrp8 complex indicates that it is involved in mRNA metabolism and translational regulation. Zfrp8, Nufip, FMRP, and Tral are all part of the complex, and Zfrp8 interacts antagonistically with Fmr1 and tral, suppressing their oogenesis defects. Furthermore, it was determined that Zfrp8 is required within the nucleus, and controls FMRP localization within the cytoplasm. It was further confirmed that FMRP functions in heterochromatin silencing and that Zfrp8 is required in the same process, but has an opposite function of FMRP. It is proposed that Zfrp8 functions as a chaperone of the FMRPâ€™ containing RNP translational repression complex and controls the temporal and spatial activity of this complex (Tan, 2016). Zfrp8 is essential for stem cell maintenance, but its molecular functions have not yet been clearly defined. Two distinct approaches were taken to address this question. A yeast-two hybrid screen was performed to identify direct interactors of Zfrp8, and the components of the Zfrp8 complex were characterized by mass spectrometry (Tan, 2016). Because of the high sequence and functional conservation of Zfrp8 (flies) and PDCD2 (mammals), and because no stem cell-derived cDNA library exists in Drosophila, a mouse embryonic stem cell cDNA library was screened using mammalian PDCD2 as bait. Forty-six initial positives were isolated, and 19 potential interactors were identified after re-testing of the positives (Tan, 2016). In order to purify the Zfrp8 protein complex a transgenic line was established expressing NTAP-tagged Zfrp8 under the control of the general da-Gal4 (daughterless) driver. Two-step tandem affinity purification was performed on embryonic extracts and the purified proteins were separated by SDS-PAGE electrophoresis. The proteins were eluted and analyzed by mass spectrometry. Thirty proteins were identified as part of the Zfrp8 complex. The threshold for interactors was set to at least 5x peptide enrichment in Zfrp8 over vector control fractions. Eighteen of the proteins are predicted to function in ribosomal assembly or translational regulation, strongly suggestive of a function of Zfrp8 in mRNA processing (i.e. translation, localization, and stability). In the complex six ribosomal subunits were found (five 40S subunits and one 60S subunit); EF2 and eIF-4a, which are required for translation initiation and elongation; and FMRP, Tral and Glorund which function in mRNA transport and translational repression. While Zfrp8 interacts with several ribosomal proteins it does not appear to be part of the ribosome itself (Tan, 2016). No overlapping interactors were found in the yeast-two hybrid screen and mass spectrometry assay. But interestingly, FMRP was identified as part of the Zfrp8 complex by mass spectrometry and NUFIP1 in a yeast-two hybrid assay. Most likely Nufip (estimated 57 kD) was not identified as part of the Zfrp8 complex in the TAP-purification approach, because proteins with similar size to tagged Zfrp8 (~55 kD) were excluded from the mass spectrometry analysis. To investigate whether these proteins could work together in the same molecular process, the interaction of both Zfrp8 and PDCD2 with Nufip (flies) and NUFIP1 (mammals) was confirmed in tissue culture cells. Immunoprecipitation of human HEK293 cell extracts expressing FLAG-tagged NUFIP1 pulled down endogenous PDCD2. Next whether this protein interaction also exists in Drosophila was examined. It was possible to co-purify endogenous Zfrp8 with NTAP-tagged Nufip from transfected S2 cells. An additional Western blot was performed on the purified NTAP-Nufip isolate and it was shown that FMRP is present in the protein complex, indicating that Nufip physically interacts with both Zfrp8 and FMRP. These results suggest that all three proteins function together in a molecular complex which regulates RNP processing/assembly and translation. Based on these results, and the requirement of both Zfrp8 and Fmr1 in stem cell maintenance, it was decided to characterize the genetic interaction between these genes (Tan, 2016). To further characterize the connection between the two genes, whether the loss of Zfrp8 can modify oogenesis defects reported for Fmr1 females. Similar to what was previously reported, 100% of Fmr1Δ50M/Df(3 R)Exel6265 and 80% of Fmr1Δ50M/Fmr13 ovaries displayed developmental defects. The ovarioles contained fused egg chambers, aberrant nurse cell numbers. Occasionally, egg chambers with oocyte misspecification/multiple oocytes were also observed. Interestingly, the loss of one copy of Zfrp8 suppressed the majority of Fmr1 ovary defects, restoring cell division in the germline, as well as egg chamber morphology and separation. In Zfrp8/+; Fmr1Δ50M/Df(3R)6265, fusion of the first egg chamber is still observed in most germaria, but despite this, oogenesis appears to proceed normally resulting in normal looking ovarioles. Zfrp8/+; Fmr1Δ50M/Fmr13 ovaries appear almost completely normal even though these ovarioles contain no FMRP (Tan, 2016). The loss of Fmr1 has also been associated with a strong reduction in egg production. This study found that similar to previous reports, Fmr1Δ50M/Df(3R)Exel6265 and Fmr1Δ50M/Fmr13 mutants display a strong reduction in fertility; females laid on average of 1 and 6 eggs/day, respectively, as compared to 18 eggs/day for wild-type flies. The removal of one copy of Zfrp8 partially suppressed Fmr1 infertility and resulted in 8 eggs/day from Fmr1Δ50M/Df(3R)Exel6265 and 15 eggs/day from Fmr1Δ50M/Fmr13 females. These results demonstrate that Zfrp8 and Fmr1 affect the same process and that even though they are found in the same complex, have opposing functions (Tan, 2016). To investigate the nature of the Zfrp8 interaction with FMRP, the localization of the proteins within the ovary was examined. Zfrp8 displays ubiquitous distribution in all cells and cell compartments of the wild type ovary. No significant changes in Zfrp8 localization or levels are visible in Fmr1 ovaries. FMRP has a more varied distribution pattern, present in strong, cytoplasmic puncta in the cytoplasm of nurse cells and follicle cells, and also in high levels in the cytoplasm of the maturing oocyte. FMRP is also detectable in low levels in nurse cell nuclei at stage 8 egg chambers at an average of 9.76 puncta per nucleus. As expected, Fmr1 ovaries display no FMRP staining in either the cytoplasm or nucleus (Tan, 2016). To determine whether Zfrp8 functions in FMRP regulation, Zfrp8 was depleted in the germline by expressing Zfrp8 RNAi under the control of the nos-Gal4 driver, and changes in FMRP expression were assessed. In control nos-Gal4 ovaries, FMRP levels and distribution were similar to that in wild-type ovaries. However, in Zfrp8 KD ovaries, aberrant FMRP localization is observed in the germline; FMRP is more uniformly distributed throughout the cytoplasm and puncta are strongly diminished. Remaining FMRP puncta appear fragmented, reduced in intensity, size and number (~10% of wild-type). These results indicate a Zfrp8 requirement for proper FMRP localization to the cytoplasm. FMRP normally functions by shuttling mRNA cargo from the nucleus to the cytoplasm, where it represses the translation of bound mRNA. The observed change of FMRP localization in Zfrp8 KD ovaries therefore may indicate a regulatory function for Zfrp8 in the nuclear export and localization of FMRP (Tan, 2016). Zfrp8 protein is present in both the cytoplasm and nucleus and, as demonstrated above, controls the distribution of FMRP in the cytoplasm. It was decided to investigate the cell compartment in which Zfrp8 is required, in order to elucidate how Zfrp8 regulates FMRP. To do so, the capability of Zfrp8 deletion constructs to rescue mutant lethality was examined. Expression of human PDCD2 cDNAs driven by the general driver da-Gal4 is fully capable of rescuing Zfrp8 lethality. Mutated Zfrp8 constructs were created, removing either the two putative NLSs or the putative NES domains. These proteins were expressed under the da-Gal4 driver, and while clearly overexpressed on Western blots, failed to rescue mutant lethality, suggesting that the three domains are essential for the function of the protein (Tan, 2016). In an alternative approach, the function of Zfrp8 proteins targeted to a distinct cell compartment was examined. Four N-terminal GFP-tagged transgenic proteins were expressed, encoding a wild-type Zfrp8, nuclear-localized NLS-Zfrp8, cytoplasmic-localized NES-Zfrp8, and cell membrane-localized CD8-GFP-Zfrp8. Transgenic Zfrp8 subcellular localization is visible when the proteins are strongly overexpressed. When the transgenes were expressed at lower levels, similar to the endogenous levels, with the hsp70-Gal4 driver at 25 oC, both wild-type and nuclear-localized Zfrp8 were able to rescue mutant lethality at similar rates, whereas the cytoplasmic- and membrane-localized proteins did not show rescue. These results show that Zfrp8 is required in the nucleus and suggest that like FMRP, Zfrp8 may function by shuttling between nuclear and cytoplasmic compartments (Tan, 2016). This study has shown that FMRP and Zfrp8 are present in the same protein complex. In addition to FMRP, the mass spectrometry results have also identified other translational regulators, such as Tral. Tral has previously been shown to function in conjunction with FMRP to control the translation of mRNAs (Tan, 2016). To determine whether Zfrp8 functions in Tral/FMRP-associated translational regulation, the genetic interaction between Zfrp8 and tral was investigated. Tral regulates dorsal-ventral (D/V) patterning through the localization and translational control of gurken (grk) mRNA. Eggs laid by tral females display ventralized chorion phenotypes, due to the aberrant Gurken morphogen gradient. If Zfrp8 functions to regulate the translational activity of FMRP/Tral, a suppression of the tral ventralized phenotypes should be apparent when Zfrp8 is reduced. Tral was depleted in the germline by expressing a TRiP RNAi lineunder the control of the nos-Gal4 driver. Tral KD resulted in similar ventralized egg phenotypes as previously observed in eggs laid by tral1 females: 1% of eggs displayed two normal dorsal appendages (Wt), 36% had fused appendages, and 63% had no dorsal appendages. Removing one copy of Zfrp8 in the tral KD background suppressed the tral phenotypes. This genetic interaction suggests that in addition to controlling the localization of FMRP in the cytoplasm, Zfrp8 also influences the translational control by Tral, essential for formation of dorsal-ventral polarity in the egg (Tan, 2016). Whether Zfrp8 regulates Tral localization as it does FMRP was investigated by examining the distribution of GFP-fusion Tral protein trap line. Tral protein was uniformly present in cytoplasmic compartments of germline and somatic cells, with stronger granules surrounding nuclei, and was highly enriched within the oocyte. Zfrp8 KD results in loss of oocyte identity, and the distribution of Tral was significantly altered in those cells. But in all other germline cells Tral distribution remained unaffected. Tral and its orthologs are cytoplasmic proteins and examination of the Tral protein sequence identifies no NLSs. Zfrp8 may therefore interact only indirectly with Tral and not regulate its localization (Tan, 2016). Zfrp8 and Fmr1 control position effect variegation piRNA pathway genes have been shown to be essential for heterochromatin packaging in position effect variegation (PEV) experiments. PEV measures expression of endogenous or reporter genes inserted within or adjacent to heterochromatin. Fmr1 is specifically required for chromatin packaging as loss of a single copy of Fmr1 is sufficient to inhibit heterochromatin silencing of a white reporter inserted into the pericentric heterochromatin region 118E10 on the 4th chromosome (Tan, 2016). PEV of Zfrp8 heterozygotes, Fmr1 heterozygotes and Fmr1, Zfrp8 transheterozygotes were examined using 118E10 (4th chromosome centromeric) and an additional white reporter, inserted into heterochromatin region 118E15 (4th chromosome telomeric). While thewhite+ reporters in Zfrp8null/+ eyes were expressed at levels comparable to those in wild-type controls, expression in Fmr1Δ50M/+ of both white reporters was strongly enhanced. But, the removal of one copy of both Zfrp8 and Fmr1 decreased expression of the reporters back to the Zfrp8/+, near wild-type levels, indicating restored heterochromatin silencing of both 4th chromosomal insertions. These findings suggest that in normal eyes, Zfrp8 functions upstream of Fmr1 and controls Fmr1 effects on heterochromatin packaging (Tan, 2016). A connection between regulation of heterochromatin silencing and Piwi has clearly been established and the current results show that Zfrp8 and FMRP are part of the mechanism that controls heterochromatin silencing. Heterochromatin is established at the blastoderm stage in Drosophila embryos and is subsequently maintained throughout development. Thus, FMRP and Zfrp8 function together in heterochromatin packaging in the early embryo in the same way as they do during oogenesis (Tan, 2016). This study has shown that Zfrp8 is part of a complex that is involved in RNA processing, i.e. translation, localization, and stability. It is proposed that Zfrp8 likely forms a ribonucleoprotein complex with Nufip, FMRP and select mRNAs in the nucleus, and is required for localization of this complex in the cytoplasm. After nuclear export, mRNAs within the complex are targeted for translational control and repression by FMRP and Tral. The suppression of the Fmr1 and tral phenotypes in a Zfrp8 heterozygous background, occurs in the absence of Fmr1 and the strong reduction of tral. This suggests that Zfrp8 function is not protein specific, but rather that it controls the FMRP and Tral-associated complex, even in the absence of each of the two proteins. This hypothesis is consistent with Zfrp8 actively controlling the localization of FMRP to cytoplasmic foci, as this localization is affected in Zfrp8 germ cells (Tan, 2016). Previous studies identified a piRNA pathway protein, Maelstrom (Mael), that is controlled by Zfrp8 in a similar manner as FMRP. Zfrp8 forms a protein complex with Mael, genetically suppresses the loss of mael, and controls Mael localization to the nuage, a perinuclear structure. But the Zfrp8 phenotype is stronger and appears earlier than that of mael, tral, Fmr1, or other piRNA pathway regulatory genes studied so far. Zfrp8 may therefore control a central step in the regulation of specific RNPs. Consistent with this hypothesis, the TAP purification and mass spectrometry analysis identified a number of Zfrp8-associated proteins, the majority of which function in ribosomal assembly or translational regulation, such as the ribosomal protein RpS2. And Zfrp8 KD in the germ line and partial loss of rps2 result in a similar "string of pearls phenotype", caused by developmental arrest in early stages of oogenesis. In addition, a recent study has shown that Zfrp8 and PDCD2 contain a TYPP (TSR4 in yeast, YwqG in E. coli, PDCD2 and PDCD2L in vertebrates and flies) domain, which has been suggested to perform a chaperone-like function in facilitating proteinâ€“protein interactions during RNA processing. These observations lead to a hypothesis that Zfrp8 functions as a chaperone essential for the assembly of ribosomes and the early recruitment and localization of ribosomal-associated regulatory proteins, such as FMRP, Tral and Mael (Tan, 2016). Zfrp8 negatively controls the functions of Fmr1 and tral. In the absence of FMRP and Tral the temporal and spatial control of translation of their associated RNPs is lost. It is proposed that reducing the level of Zfrp8 diminishes the availability of these RNP-complexes in the cytoplasm resulting in suppression of the Fmr1 and tral phenotypes (Tan, 2016). Zfrp8, Fmr1 and tral have all been shown to genetically and physically interact with components of the piRNA pathway, and to regulate the expression levels of select transposable elements. Transposon de-repression is often associated with the loss of heterochromatin silencing. The molecular mechanisms underlying heterochromatin formation appear to involve maternally contributed piRNAs and piRNA pathway proteins that control the setting of epigenetic marks in the form of histone modifications, maintained throughout development. But transposon expression can also be controlled post-transcriptionally by cytoplasmic PIWI-piRNA complexes, suggesting that transposon deregulation and heterochromatin silencing phenotypes seen in FMRP and Zfrp8 may be linked to translational de-repression. It is proposed that by facilitating the early assembly of ribosomes with specific translational repressors, Zfrp8 regulates several developmental processes during oogenesis and early embryogenesis including dorsal-ventral signaling, transposon de-repression, and position effect variegation (Tan, 2016). RNA metabolism controls multiple biological processes, and a specific class of small RNAs, called piRNAs, act as genome guardians by silencing the expression of transposons and repetitive sequences in the gonads. Defects in the piRNA pathway affect genome integrity and fertility. The possible implications in physiopathological mechanisms of human diseases have made the piRNA pathway the object of intense investigation, and recent work suggests that there is a role for this pathway in somatic processes including synaptic plasticity. The RNA-binding fragile X mental retardation protein (FMRP, also known as FMR1) controls translation and its loss triggers the most frequent syndromic form of mental retardation as well as gonadal defects in humans. This study demonstrates for the first time that germline, as well as somatic expression, of Drosophila Fmr1 (denoted dFmr1), the Drosophila ortholog of FMRP, are necessary in a pathway mediated by piRNAs. Moreover, dFmr1 interacts genetically and biochemically with Aubergine, an Argonaute protein and a key player in this pathway. These data provide novel perspectives for understanding the phenotypes observed in Fragile X patients and support the view that piRNAs might be at work in the nervous system (Bozzetti, 2015). dFmr1 acts in the piRNA pathway. dFmr1 controls fertility in males and females. dFmr1 and Aub colocalize in testis and ovaries and interact biochemically. dFmr1 interacts genetically with Aub in the piRNA pathway. dFmr1 affects the piRNA pathway in the somatic and in the germline cells of the adult testes. The dFmr1 larval synaptic phenotype is rescued by Aub somatic expression. dFmr1 is a translational regulator and its role in the miRNA pathway is widely accepted. This study provides several lines of evidence that dFmr1 can be considered as a ‘bona fide’ member of the piRNA pathway that keeps repetitive sequences and transposons silenced. First, dFmr1 mutant testes display crystalline aggregates, as do other mutants of the piRNA pathway. Second, the levels of cry (Suppressor of Stellate)-specific and transposon-specific piRNAs dramatically decrease in dFmr1 mutant testes. Third, as a consequence of this decrease, the Ste RNA is produced and, in addition, transposons are expressed at higher levels than in wt animals. Fourth, dFmr1 mutant animals display fertility defects, a phenotype shown by several mutations affecting the piRNA pathway. The fact that earlier screens did not identify dFmr1 as a member of the somatic piRNA pathway could be due to the heterogeneous phenotypes observed with the somatic transposons (this study) and/or to the material used for those assays. The cry–Ste system thus proves very efficient for identifying new members of this important pathway (Bozzetti, 2015). The movement of transposable elements is one of the molecular causes of DNA instability and sterility. Considering that human patients mutant for FMRP also display defects in male and female gonads, it will be interesting to characterize the activity of transposons and repetitive sequences in the gonads of mice or humans that are mutant for the FMRP pathway, although there might be no observable defects in mammals because they express three members of the FMRP family versus the single ortholog in fly. Finally, mutations affecting the piRNA pathway might also induce gonadal defects in humans (Bozzetti, 2015). Until now, the members of the piRNA pathway controlling the cry–Ste interaction, including Aub, have been described as being required in the male germline. Surprisingly, the conditional dFmr1 rescue and KD experiments demonstrate that dFmr1 controls the piRNA pathway both in the germline and in the somatic cells of the gonad, which raises questions as to the somatic contribution of other members of the piRNA pathway in the male gonad. The phenotypes induced by somatic Aub expression also suggest that the hub expresses one or more AGO proteins that are involved in the somatic piRNA-mediated Ste silencing and that interact with dFmr1; however, the only other protein of the Piwi clade present in the somatic tissue, Piwi, does not participate in Ste silencing. Based on preliminary data, this study proposes that AGO1 might be one such protein. First, AGO1/+ testes display Ste-made crystals, as do testes expressing UAS-AGO1 RNAi driven by the upd-Gal4 driver. Second, aubsting rescues the AGO1-mediated crystal phenotype. Third, AGO1 and dFmr1 interact biochemically and are known to interact genetically in the ovaries to control germline stem cell maintenance, as well as in the nervous system, where they modulate synaptic plasticity. Taken together, these data suggest that AGO1 contributes to the piRNA pathway that controls the cry–Ste system in the somatic part of the gonad (Bozzetti, 2015). The finding that Aub somatic expression affects the NMJ and counteracts the AGO1 loss of function phenotype is also unexpected. Recent work has documented the activation of piRNA pathway in the nervous system in flies, mice, humans and molluscs and it has been proposed that synaptic plasticity, cognitive functions and neurodegeneration might involve the control of genome stability, even though the precise mode of action and impact of this pathway are not completely understood. Because Aub is not required in the larval somatic tissues, its ectopic expression could affect the NMJ by replacing AGO1 in its known role on the miRNA pathway. However, AGO1 might also affect the NMJ through the piRNA pathway, much in the same way as AGO1 loss of function affects a piRNA pathway in the gonad. Even though AGO1 has been previously described as being exclusively involved in the miRNA pathway, some degree of overlapping between different RNAi pathways has been recently described: (1) the double-stranded-RNA-binding protein Loquacious (Loqs) is involved in the miRNA pathway and in the endogenous siRNA pathway, (2) AGO1 and AGO2 can compete for binding with miRNAs, and (3) ectopic expression of Aub in the soma competes for the siRNAs pathway mediated by AGO2. In addition, miRNAs have been demonstrated to have a role on easi-RNA biogenesis in plants. In a similar manner, AGO1 could act on piRNAs through its activity on the miRNA pathway. Although future studies will clarify the connection between AGO1 and the piRNA pathway, the present data provide novel perspectives in the field and could have a broad relevance to diseases affecting cognitive functions (Bozzetti, 2015). Expression, genetic and biochemical data indicate that Aub and dFmr1 interact directly. dFmr1 has been proposed to bind specific cargo RNAs and the human FMRP binds small RNA, in addition to mRNAs. Similarly, the Aub–dFmr1 interaction might allow the targeting of piRNAs to the transcripts of repetitive sequences and transposable elements, dFmr1 providing the molecular link between small RNAs and AGO proteins of the RISC (Bozzetti, 2015). The Aub and dFmr1 proteins colocalize and likely interact in the piRNA pathway in a specific stage of testis development and also have additional functions that are independent from each other. Typically, dFmr1 accumulates at high levels in more differentiated cells of the testis, where Aub is not detectable, likely accounting for the axoneme phenotype described in dFmr1 testes. In the future, it will be interesting to analyze whether the other genes involved in the piRNA pathway in testis are also required at specific stages, as also recently found in the ovary (Bozzetti, 2015). Finally, FMRP proteins work in numerous molecular networks, show complex structural features (TUDOR, KH, NLS, NES RGG domains) and are characterized by widespread expression and subcellular localization (cytoplasm, nucleus, axons, dendrites, P bodies), providing versatile platforms that control mRNA and small RNA metabolism (e.g. translation, degradation and transport). Understanding whether FMRP proteins interact with other members of the piRNA pathway, whether this interaction is modulated physiologically and how does the interaction with this pathway compare with that observed with other AGO proteins will clarify the role and mode of action this family of proteins in small RNA biogenesis and metabolism (Bozzetti, 2015). The biogenesis of the piRNAs requires two pathways. The primary pathway involves Piwi and predominantly occurs in the somatic tissues. The ping-pong pathway involves Aub, as well as AGO3, and predominantly occurs in the germline, where Aub is thought to bind an antisense piRNA, to cleave the sense transcript from an active transposon and to produce a sense piRNA that is loaded onto AGO3. The AGO3–piRNA complex binds complementary transcripts from the piRNA cluster, producing the so-called secondary piRNAs by an amplification loop. Although the piRNA pathways have emerged as a very important tool to understand the role of RNA metabolism in physiological and pathological conditions, the relationship and interactions among the involved proteins are not simple to interpret, mostly because not all the players have been characterized. Moreover, recent data support the hypothesis that the somatic and the germline piRNA pathways share components: for example, shutdown (shu), vreteno (vret) and armitage (arm) affect primary as well as ping-pong pathways in ovaries. Results from this study call for a role of dFmr1 in both piRNA pathways at least in testes. Based on the alignment of the human, mouse and fly FMRP family members, dFmr1 might participate in piRNA biogenesis as a Tudor domain (TDRD) containing protein (Bozzetti, 2015). TDRDs are regions of about 60 amino acids that were first identified in a Drosophila protein called Tudor. In the recent years, the requirement of TDRD proteins in piRNA biogenesis and metabolism has become evident. Typically, the founding member of the family, Tudor, binds AGO proteins and helps them interact with specific piRNAs. Among the different TDRD proteins, fs(1)Yb works in the primary pathway; Krimper, Tejas, Qin/Kumo, and PAPI work in the ping-pong pathway; and Vret works in both systems. PAPI, the only TDRD protein that has a modular structure closely related to dFmr1 (two KH domains and one TDRD), interacts with the di-methylated arginine residues of AGO3 and controls the ping-pong cycle in the nuage. At least during the early stages of testis development, dFmr1 might interact with Aub in a similar way. Given that TDRDs are involved in the interactions between proteins and in the formation of ribonucleoprotein complexes, future studies will assess whether RNAs mediate the Aub–dFmr1 interaction (Bozzetti, 2015). In conclusion, the discovery of dFmr1 as a player in the piRNA pathway highlights the importance of the fly model. Data from this study also adds a new perspective to understanding the role and mode of action of this protein family and the physiopathological mechanisms underlying the Fragile X syndrome (Bozzetti, 2015). Fragile X syndrome (FXS) is the most common form of inherited mental retardation, and it is caused by loss of function of the fragile X mental retardation protein (FMRP). FMRP is an RNA-binding protein that is involved in the translational regulation of several neuronal mRNAs. However, the precise mechanism of translational inhibition by FMRP is unknown. This study shows that FMRP inhibits translation by binding directly to the L5 protein on the 80S ribosome. Furthermore, cryoelectron microscopic reconstruction of the 80S ribosome⋅FMRP complex shows that FMRP binds within the intersubunit space of the ribosome such that it would preclude the binding of tRNA and translation elongation factors on the ribosome. These findings suggest that FMRP inhibits translation by blocking the essential components of the translational machinery from binding to the ribosome (Chen, 2014). Inhibition of translation by FMRP. WGGA and ACUK sequences in the mRNA are not important for translational inhibition by FMRP. Functional role for G-quadruplex sequences in the mRNA. FMRP binds directly and with high affinity to the ribosome. FMRP binds close to ribosomal protein L5 on the ribosome. FMR1 encodes an RNA binding protein, fragile X mental retardation protein (FMRP) that is highly expressed in the brain and FMRP appears to regulate the expression of many proteins throughout the brain. FMRP has three RNA-binding domains: one RGG domain that is rich in arginines and glycines and two hnRNP K homology domains (KH domains). Consistent with its proposed role in regulating protein synthesis, the majority of FMRP in the cell is associated with polyribosomes. Interestingly, a missense mutation in the KH2 domain (Ile304Asn of human FMRP) abolishes the binding of FMRP to polyribosomes and causes an aggravated form of FXS in humans. This suggests that RNA binding by FMRP plays a key functional role in the brain. In vitro selection experiments identify a G-quadruplex structure and a pseudoknot structure as the potential RNA ligands for the RGG and KH2 domains, respectively. Based on these results it is proposed that FMRP may bind to mRNAs that possess G-quadruplex- or pseudoknot-forming sequences and repress their translation. Additionally, many proteins, microRNAs and noncoding RNAs have been proposed to be important for translational repression by FMRP (Chen, 2014). To understand the mechanism of translational inhibition by FMRP, this study used the Drosophila FMRP (dFMRP) homolog, in which the RNA-binding domains are nearly 75% identical to human FMRP. Both the full-length and a N-terminally truncated dFMRP (NT-dFMRP) were purified and an in vitro translation system (IVTS) made from Drosophila embryo extract was used to test the activity of dFMRP. Renilla luciferase mRNA was used as the reporter for protein synthesis because it has three G-rich sequences that potentially form G-quadruplex structures, and additionally has 7 ACUK and 6 WGGA sequences. The time course of protein synthesis was monitored by bioluminescence. The addition of dFMRP or NT-dFMRP to the IVTS inhibits the synthesis of luciferase. NT-dFMRP was used in further studies because it is equally active in inhibiting translation as the full-length protein and easier to purify than the full-length dFMRP (Chen, 2014). Titration experiments show that the inhibition of translation depends on the concentration of NT-dFMRP added to the IVTS. NT-dFMRP also inhibits the translation of luciferase mRNAs that do not have a N7-methyl guanosine cap at the 5′ end or a 3′ poly(A) tail, indicating that translation inhibition is 5′ cap and poly(A) tail independent. To confirm that the inhibition of translation by NT-dFMRP is 5′ cap-independent, uncapped luciferase mRNA with an internal ribosome entry site (IRES) was synthesized from the Reaper mRNA at the 5′ end. IRES-dependent translation of luciferase mRNA is as efficient as the translation with the 5′ capped mRNA. NT-dFMRP inhibits the translation of luciferase mRNA having the IRES element, confirming that the 5′ cap is not essential for inhibition. These results also suggest that FMRP does not affect the initiation step of protein synthesis (Chen, 2014). Previous studies suggest that FMRP associates directly with the ribosome. However, other reports show that FMRP binds to the ribosome via the mRNA or as an mRNP complex. It is not clear whether mRNA or other components are required for the association of FMRP with the ribosome. By using gel filtration chromatography and SDS-PAGE, it was shown that NT-dFMRP can indeed bind directly to the ribosome in the absence of mRNA. Furthermore, the binding of NT-dFMRP to the ribosome is stoichiometric even though excess amount of NT-dFMRP is present in the binding reaction. Next, the binding of NT-dFMRP with functionally relevant mutations in the KH1 (I244N) or KH2 (I307N) domains was tested. The KH1 mutant shows a 2-fold reduced binding to the 80S ribosome, while the KH2 mutant binds to a similar extent as NT-dFMRP. The binding results are consistent with functional data, which show that the KH1 domain is important for translational inhibition by NT-dFMRP (Chen, 2014). A cryo-EM map of the Drosophila 80S ribosome•NT-dFMRP complex was obtained to determine the three-dimensional (3D) binding position of NT-dFMRP on the ribosome. Subtraction of the 3D map of the control Drosophila 80S ribosome from that of the 80S ribosome•NT-dFMRP complex shows an elongated mass of density, within the ribosomal inter-subunit space, that spans from central protuberance (CP) to α-sarcin/ricin stem-loop (SRL) region of the 60S subunit. One end of the elongated difference mass interacts with the CP and A-site finger (ASF) of the 60S subunit, while its other end is situated between the protein S12 region of the small (40S) subunit and SRL region of the 60S subunit. Cross-linking data suggests that the N-terminus of the NT-dFMRP construct interacts with the CP protein L5; consequently, that portion of the difference map is assigned to the N-terminus, and the portion between S12 and SRL is tentatively assigned to the C-terminus domain of FMRP. Both the crosslinking and cryo-EM results agree with a previous tandem affinity purification analysis of dFMRP from a cytoplasmic lysate, which showed that FMRP could interact with ribosomal proteins L5 and L18, both located in the CP of the 60S subunit. Indeed, a direct interaction of NT-dFMRP is observed with protein L5. The previous interaction reported with protein L18 could involve the N-terminus of the full-length FMRP that is absent in the construct used in this study. Docking of an I-TASSER homology model of NT-dFMRP into the corresponding cryo-EM map density tentatively places its KH1 and KH2 domains interacting with the CP and ASF, respectively, of the 60S subunit. This region of the 60S subunit would normally be occupied by a tRNA in the peptidyl site (P site) during protein synthesis. Superimposition of the ribosome-bound FMRP and previously known binding position of the tRNA at the ribosomal P site indicates that the KH1 and KH2 domains of FMRP would partially overlap with the anticodon arm of the tRNA. However, future structural studies with a translationally inhibited ribosome•FMRP complex carrying a tRNA in the P site will be essential to understand if and how both the P-site tRNA and FMRP would be accommodated simultaneously on the ribosome (Chen, 2014). Fragile X syndrome (FXS), caused by loss of FMR1 gene function, is the most common heritable cause of intellectual disability and autism spectrum disorders. The FMR1 protein (FMRP) translational regulator mediates activity-dependent control of synapses. In addition to the metabotropic glutamate receptor (mGluR) hyperexcitation FXS theory, the GABA theory postulates that hypoinhibition is causative for disease state symptoms. This study uses the Drosophila FXS model to assay central brain GABAergic circuitry, especially within the Mushroom Body (MB) learning center. All 3 GABAA receptor (GABAAR) subunits are reportedly downregulated in dfmr1 null brains. Parallel downregulation of glutamic acid decarboxylase (GAD), the rate-limiting GABA synthesis enzyme, is demonstrated although GABAergic cell numbers appear unaffected. Mosaic analysis with a repressible cell marker (MARCM) single-cell clonal studies show that dfmr1 null GABAergic neurons innervating the MB calyx display altered architectural development, with early underdevelopment followed by later overelaboration. In addition, a new class of extra-calyx terminating GABAergic neurons is shown to include MB intrinsic α/β Kenyon Cells (KCs), revealing a novel level of MB inhibitory regulation. Functionally, dfmr1 null GABAergic neurons exhibit elevated calcium signaling and altered kinetics in response to acute depolarization. To test the role of these GABAergic changes, pharmacological restoration of GABAergic signaling is attempted and effects on the compromised MB-dependent olfactory learning in dfmr1 mutants are assayed, but no improvement is found. These results show that GABAergic circuit structure and function are impaired in the FXS disease state, but that correction of hypoinhibition alone is not sufficient to rescue a behavioral learning impairment (Gatto, 2014). Null dfmr1 brains show GAD loss in normally arrayed GABAergic circuitry. Gross GABAergic innervation of the MB calyx is unaltered in dfmr1 null brains. Generation of dfmr1 null MARCM clones from birth-dated GABAergic lineages. Developmental changes in GABAergic neuron architecture in dfmr1 null mutants. A novel class of MB intrinsic GABAergic neurons. Altered GABAergic neuron calcium dynamics in dfmr1 null mutants. Pharmaceutical GABAergic modulation in MB-dependent olfactory learning. The lion's share of FXS neuronal studies have focused on glutamatergic hyperexcitation, but there is clear evidence that GABAergic hypoinhibition may also be important in both Drosophila and mouse disease models. This study probed GABAergic circuitry in the Drosophila brain, especially in relation to the MB olfactory learning and memory center, and assessed GABAergic modulation as an FXS intervention strategy. In dfmr1 null mutants, depressed GAD expression, altered GABAergic neuron architecture and developmental refinement, and altered GABAergic neuron calcium signaling function within the MB circuit were found, consistent with GABAergic dysfunction contributing to compromised MB-dependent learning in the Drosophila FXS model. However, pharmacological attempts to alleviate GABAergic signaling defects, modeled on previously reported successful intervention strategies feeding GABA and a GABA reuptake inhibitor, NipA, did not improve the behavioral output in dfmr1 null mutants. Taken together, this study reveals GABAergic impairments in the FXS disease state, but does not show that GABAergic hypoinhibition is a strong determinant of the learning component of FXS cognitive compromise (Gatto, 2014). Results from this study support the reported loss of gad mRNA in the Drosophila FXS model and reduced GAD protein in the amygdala basolateral nucleus in the mouse FXS model. Importantly, FMRP has been suggested to bind gad mRNA directly based on cross-linking immunoprecipitation (HITS-CLIP). However, given FMRP is best defined as a translational repressor (e.g. MAP1B/futsch, profilin/chickadee etc. ), this direct interaction would predict GAD elevation, not the reported loss in the FXS disease state. Alternatively, FMRP may confer transcript stability, such that in its absence gad mRNA would be subject to degradation, causing subsequent loss of the GAD protein. During development, loss of GABA production may have consequences unrelated to its mature inhibitory function, as GABA can serve as an excitatory neurotransmitter in immature stages owing to the high intracellular chloride concentration maintained by Na+/K+/Cl− co-transporter NKCC1. In Drosophila, however, early GABA roles in synaptogenesis, circuit establishment, and transmission are unclear, as detectable levels of GABA are reported only late in development, since regulatory mechanisms reportedly suppress GAD activity during earlier maturation phases. Developmental roles for GABA will be an area of future investigation in the Drosophila FXS model (Gatto, 2014). GAD-positive neurons have been reported to innervate the Drosophila MB calyx, with GAD-Gal4-driven synaptobrevin-GFP punctae adjacent to the inner rim of the actin-rich microglomerular rings, establishing GABAergic synaptic input on KCs and/or PNs. This GABAergic innervation appears grossly normal in dfmr1 mutants, with a normal array of cell bodies and projection pathways. dBrainbow subdivision of the complex GABAergic circuitry suggests that GABAergic lineages are also normal in dfmr1 nulls. Therefore, there is no evidence that FMRP is required for the generation, placement, or maintenance of GABAergic neurons in the Drosophila brain. However, MARCM clonal analyses employed for single-cell resolution to test cell-autonomous FMRP requirements show that dfmr1 null MB-innervating GABAergic neurons display early undergrowth in complex cells followed by later overgrowth in simple cells. Thus, the developmental trajectory of GABAergic innervation is dependent upon FMRP. The GABAergic neuron undergrowth opposes the overgrowth seen in excitatory KCs at the same period of MB development, consistent with theories of GABAergic circuit hypoinhibition in the presence of hyperexcitation in the FXS disease state. In MB-extrinsic GABAergic neurons, FMRP may enhance the expression of targets involved in synapse assembly/maintenance early in development and repress them later, while the converse occurs in MB-intrinsic excitatory KCs. The cell-type-specific translation roles for FMRP in these inhibitory vs. excitatory neurons will be an area of future investigation in the Drosophila FXS model (Gatto, 2014). In addition to MB-extrinsic GABAergic neurons, it was discovered that a subset of MB-intrinsic KCs is also GABAergic, as confirmed by co-labeling for both GAD and GABA. These newly-defined GABAergic neurons provide a potentially self-regulating inhibitory component within the MB circuit proper, which has not previously been recognized. This late-born class of MB-intrinsic GABAergic neurons can be MARCM marked with HS induction applied as late as pupal day 4 (9d AEL), giving them a birthdate easily distinguished from the early-born MB-extrinsic GABAergic neurons. Importantly, late-born MB core neurons play a permissive role in long-term memory formation, able to both facilitate and limit memory consolidation. These core KCs transiently express glutamate during early MB development, but then transition to a different neurotransmitter output (Gatto, 2014). Beyond their architecture, dfmr1 GABAergic neurons display altered calcium signaling dynamics in response to depolarization, showing elevated and prolonged responses. This signaling change may serve as a compensatory mechanism, as GAD activity can be upregulated by increasing intracellular calcium. In Drosophila embryos, negative regulation of GAD can be overridden by agents that elevate free calcium (i.e., thapsigargin and monensin). It is unclear whether a similar calcium-dependent modulation of GAD might occur in the brain, but this possibility suggests a prospective means to circumvent GAD depression in the FXS disease state. Elevated calcium signaling could also drive direct enhancement of GABA release. In the mouse FXS model striatal region, spontaneous miniature inhibitory synaptic event frequency is elevated, presumably from increased GABA release, even with a lower density of GABAergic synapses. In contrast, GABAergic tonic inhibition is decreased in pyramidal cells, although phasic currents remain unchanged, implicating GABA receptor not neurotransmitter insufficiencies. However, the mouse amygdala exhibits decreased frequency/amplitude of both tonic and phasic inhibitory currents, linked to decreased GABAergic synapse number and reduced GAD65/67 levels. These findings reveal brain-region-specific changes in the mouse FXS model (Gatto, 2014). How might GABAergic circuit dysfunction be corrected in the FXS disease state? Earlier studies report that feeding with GABA or the GABA reuptake inhibitor NipA is remarkably effective in correcting a range of dfmr1 null mutant phenotypes, including glutamate toxicity, Futsch/MAP1B over-expression, MB growth, and courtship behavioral memory impairments. Subsequent studies in the mouse FXS model likewise indicate correction of mutant defects using GABAAR-targeted reagents. For example, the GABAAR agonist gaboxadol/THIP restores disinhibition-related principal neuron excitability deficits in the amygdala and significantly attenuates hyperactivity and reduced prepulse inhibition, although it fails to reverse deficits in cued fear or startle response. Moreover, GABAAR modulation via benzodiazepine diazepam or neuroactive steroid alphaxalone rescues audiogenic seizures in the mouse FXS model. Clinically, an open-label FXS trial employing riluzole, hypothesized to have an inhibitory effect on glutamate release, block excitotoxic effects of glutamate, and potentiate postsynaptic GABAAR function, shows behavioral improvement assessed via the ADHD Rating Scale-IV, with significant correction of the ERK activation FXS biomarker in all subjects. Together, these studies suggest that elevating GABAergic function should be an effective strategy for treating the FXS disease state (Gatto, 2014). Nevertheless, GABAergic augmentation fails to provide any improvement in MB-dependent olfactory learning defects in the Drosophila FXS model, despite partial correction of MB structural defects. MB over-expression of the RDL GABAAR impairs olfactory learning, suggesting that elevated GABAergic signaling could be counterproductive; however, given the RDL reduction in dfmr1 mutants, the intervention was aimed only at restoration. Interestingly, RDL knockdown fails to enhance learning in cAMP signaling pathway mutants, such as rutabaga and NF1, suggesting that RDL works upstream of cAMP signaling driving learning. This connection is particularly relevant to FXS, as cAMP is reduced in patient platelets, human neural progenitor cells, and brains in both mouse and Drosophila disease models. Moreover, FMR1 overexpression in the HN2 mammalian cell line and dfmr1 overexpression in the null mutant both increase cAMP production. Finally, electrophysiological studies in Drosophila primary neuronal cultures demonstrate that application of an adenylate cyclase activator suppresses inhibitory GABAergic postsynaptic currents via tempering of GABAAR receptor sensitivity. Taken together, these findings suggest a cascade interaction between FMRP, GABAARs, and cAMP signaling during learning (Gatto, 2014). Fragile X syndrome, a common form of inherited mental retardation, is caused by loss of the fragile X mental retardation protein (FMRP). As a selective RNA-binding protein (RBP), FMRP is localized predominately in cytoplasm, where it regulates translational control. However, there is a small portion of FMRP present in the nucleus, and its function there has been elusive. This study shows that Drosophila dFMR1 in nucleus is required for replication stress-induced H2Av phosphorylation in the DNA damage response (DDR). Replication stress can induce the expression of dFmr1 and promote the nuclear accumulation of dFMR1. Upon stimulation of replication stress, dFMR1 is associated with chromatin in a domain-specific manner, which is essential for its ability to induce the phosphorylation of H2Av. These results together reveal an unexpected nuclear role of FMRP in DDR and uncover a feed-forward mechanism by which dFmr1 and early DDR induced by replication stress reciprocally regulate each other, thereby synergistically triggering activity of the DDR signaling cascade (Zhang, 2014). dFMR1 is required for chemical mutagen-induced H2Av phosphorylation in Drosophila germline. dFMR1 specifically participates in replication stress-induced DDR. Replication stress promotes dFmr1 expression at both mRNA and protein levels. Replication stress promotes dFMR1 nuclear accumulation. dFMR1 associates with chromatin in a domain-specific manner upon the stimulation of replication stress. Both the agenet and KH domains are important for dFMR1-mediated regulation of H2Av phosphorylation in DDR. FXS, the most common cause of inherited mental retardation, results from the loss of functional FMRP. Since the FMR1 gene was first cloned in 1991, most studies have focused on understanding the role of FMRP as an RBP in posttranscriptional regulation. FMRP plays important role(s) in synaptic plasticity via the regulation of mRNA transport and translation, particularly local protein synthesis in the dendrites. Although a small portion of FMRP is known to be present in nucleus, its nuclear function has remained elusive (Zhang, 2014). Earlier studies demonstrate the presence of FMRP in the nucleus, and the suggestion is that nuclear FMRP can be involved in the initial assembly of the mRNP complex, despite the lack of experimental data supporting this notion. Indeed, whether the presence of FMRP in the nucleus plays any physiological role at all is not yet clear. This study demonstrates that dFMR1 has a functional role(s) in the nucleus and is involved in the replication stress-induced DDR by stimulating H2Av phosphorylation. More intriguing still, dFMR1 carries out this function through its association with chromatin. Deletion analyses suggest that the nuclear function of dFMR1 requires its N-terminal agenet domain, which is distinct from the well-established role of FMRP in translational control. The agenet domain is a previously identified double-tudor domain that belongs to the Royal family of chromatin-binding proteins. The agenet domain is also important for the dFMR1-mediated regulation of H2Av phosphorylation in DDR. These results are consistent with the observations on the role of mammalian FMRP in DDR. It would be important for future research to determine whether specific motif(s) or chromatin signature(s) are associated with the genomic regions bound by dFMR1 (Zhang, 2014). In vivo and in vitro studies point to a potential role for FMRP in DDR. It is well known that DNA lesions are continuously generated in living cells as a result of replication errors and oxidative metabolism. The accumulation of DNA insults is associated with multiple diseases, from neurodegenerative disorders to cancers. It is therefore crucial for the cell to detect DNA damage, signal its presence, and effect DNA repair, cell cycle arrest and ultimately cell fate decisions, which are together called the DDR. Earlier work identified a novel protein that interacts with FMRP, nuclear FMRP-interacting protein (NUFIP), which colocalizes with nuclear isoforms of FMRP in a dot-like pattern. Furthermore, NUFIP was found to interact with BRCA1, a major DDR protein, to activate transcription by RNA polymerase II. It would be interesting to take this further and examine whether NUFIP is involved in the FMRP-mediated modulation of DDR (Zhang, 2014). There has been some evidence linking FMRP to cancer. It has been reported that FMRP is overexpressed in hepatocellular carcinoma cells. Moreover, patients with FXS have a decreased risk of cancer, and one FXS patient showed an unusual decrease in brain tumor invasiveness. More recent work reveals that FMRP levels correlate with prognostic indicators of aggressive breast cancer, probability of lung metastases and triple-negative breast cancer. FMRP overexpression in murine breast primary tumors also enhances lung metastasis, while its reduction has the opposite effect on cell spreading and invasion. It is therefore likely that FMRP-mediated modulation of the activity of the DDR signaling cascade could contribute to the role of FMRP in tumorigenesis (Zhang, 2014). Since the major phenotype associated with the loss of FMRP is intellectual disability, further investigation of whether the role FMRP plays in DDR could contribute to the molecular pathogenesis of fragile X syndrome is critical. Earlier work demonstrated that FMRP regulates the proliferation and differentiation of adult neural stem cells (adult neurogenesis). The loss of FMRP leads to increased proliferation and decreased neuronal differentiation, but increased glial differentiation. Altered adult neurogenesis is a major contributor to the impaired learning and memory caused by the loss of FMRP. Meanwhile, components of the DDR are known to safeguard replicative fidelity and control neuronal differentiation in neural progenitor cells. It would be interesting to test the possibility that an altered DDR response contributes to the increased proliferation of adult neural stem cells caused by the loss of FMRP (Zhang, 2014). In summary, this study demonstrates an unexpected nuclear role of FMRP in DDR and uncovers a feed-forward mechanism by which dFmr1 and early DDR induced by replication stress reciprocally regulate each other, thereby synergistically triggering the activity of the DDR signaling cascade. Determining whether this nuclear function of FMRP could affect neurodevelopment and whether the loss of FMRP has any DDR consequences in patients with fragile X syndrome will be critical areas for future research (Zhang, 2014). Topoisomerases are crucial to solve DNA topological problems, but they have not been linked to RNA metabolism. This study shows that human topoisomerase 3β (Top3β) is an RNA topoisomerase that biochemically and genetically interacts with FMRP, a protein deficient in Fragile X syndrome and known to regulate translation of mRNAs important for neuronal function and autism. Notably, the FMRP-Top3β interaction is abolished by a disease-associated FMRP mutation, suggesting that Top3β may contribute to pathogenesis of mental disorders. Top3β binds multiple mRNAs encoded by genes with neuronal functions related to schizophrenia and autism. Expression of one such gene, ptk2/FAK, is reduced in neuromuscular junctions of Top3β mutant flies. Synapse formation is defective in Top3β mutant flies and mice, as observed in FMRP mutant animals. These findings suggest that Top3β acts as an RNA topoisomerase and works with FMRP to promote expression of mRNAs critical for neurodevelopment and mental health (Xu, 2013). Top3β and TDRD3 form a complex that associates with FMRP. Several FMRP mutants have defective association with Top3β-TDRD3. TDRD3 is a bridge connecting Top3β and FMRP. Top3β associates with RNA stress granules and polyribosomes. Top3β has RNA topoisomerase activity. Top3β contains a conserved RNA-binding motif and binds mRNAs that are enriched with FMRP targets. Drosophila Top3β interacts with FMRP to promote synapse formation. Top3β works with FMRP to promote expression of a schizophrenia gene. Top3β is required for normal synaptogenesis in mice. This study utilized Drosophila to examine functions of the Top3β and its genetic interactions with FMRP. CG13472 was identified as the single Drosophila homologue of TDRD3 (dTDRD3) by homology searches. It was conformed that the endogenous dTop3β biochemically interacts with dFMR1 by IP-Western using Drosophila S2 cells. In S2 cells stably expressing Flag-tagged dTDRD3, all three proteins associate with each other, and the amount of dTop3β associating with dFMR1 is increased. These data support the notion that TDRD3 connects the other two proteins (Xu, 2013). Ectopic expression of dFMR1 in Drosophila eyes causes a rough (disorganized) eye phenotype with increased necrosis of ommatidia. Modifications of this phenotype have been used to identify factors that genetically interact with dFmr1. Interestingly, ectopic expression of dFMR1 in a dTop3β null mutant background causes a 3-fold increase in necrosis and more disorganized photoreceptor cluster in each ommatidium, when compared to ectopic expression of dFMR1 in wildtype background. The dTop3β mutant itself has normal smooth eyes, with no necrotic ommatidia detected. These data indicate that dTop3β mutation enhances the rough eye phenotype caused by dFMR1 overexpression, and suggest that dTop3β genetically interacts with dFMR1 in an antagonistic manner (Xu, 2013). In a dTDRD3 reduction-of-function mutant background (which has reduced dTDRD3 mRNA level due to a P-element insertion), ectopic expression of dFMR1 fails to induce significant roughness, evidenced by an almost complete absence of necrotic ommatidia and a better organized photoreceptor cluster in each ommatidia, when compared to ectopic expression of dFMR1 in the wildtype background. The dTDRD3 mutant itself has normal eye morphology. Taken together, these findings suggest that mutation of dTDRD3 suppresses rough eye phenotype caused by ectopic expression of dFMR1, and TDRD3 promotes function of FMRP. The fact that Top3β and TDRD3 have opposite effects on FMRP function (one negative and the other positive) implies that the two proteins may antagonize each other in some situations (Xu, 2013). A null mutation in Drosophila dFmr1 yields neuronal and behavioral defects similar to those in Fragile X patients and Fmr1 mutant mice. One defect is abnormal neuromuscular junctions (NMJs), exemplified by over-elaboration of synaptic branches and an increased number of synaptic boutons. dTop3β null mutant flies show similar NMJ abnormalities, as their branch and bouton numbers are comparable to those of dFmr1 mutants, and significantly higher than those of the wild type flies. Interestingly, the abnormal phenotype is partially suppressed in the dTop3β−/−;dFmr1−/− double mutant, as the numbers of branches and boutons are fewer in the double mutant than the single mutants. These results are reminiscent of genetic interactions between dAdar and dFmr1: whereas either single mutant exhibits abnormal NMJ phenotypes, reduction of dAdar dosage in dFmr1 mutant background corrects the abnormality. These data suggest that dTop3β and dFMR1 functionally antagonize each other in a common pathway to promote formation of normal NMJs (Xu, 2013). Fragile X syndrome (FXS), the most common inherited determinant of intellectual disability and autism spectrum disorders, is caused by loss of the fragile X mental retardation 1 (FMR1) gene product (FMRP), an mRNA-binding translational repressor. A number of conserved FMRP targets have been identified in the well-characterized Drosophila FXS disease model, but FMRP is highly pleiotropic in function and the full spectrum of FMRP targets has yet to be revealed. In this study, screens for upregulated neural proteins in Drosophila fmr1 (dfmr1) null mutants reveal strong elevation of two synaptic heparan sulfate proteoglycans (HSPGs): GPI-anchored glypican Dally-like protein (Dlp) and transmembrane Syndecan (Sdc). Earlier work has shown that Dlp and Sdc act as co-receptors regulating extracellular ligands upstream of intracellular signal transduction in multiple trans-synaptic pathways that drive synaptogenesis. Consistently, dfmr1 null synapses exhibit altered WNT signaling, with changes in both Wingless (Wg) ligand abundance and downstream Frizzled-2 (Fz2) receptor C-terminal nuclear import. Similarly, a parallel anterograde signaling ligand, Jelly belly (Jeb), and downstream ERK phosphorylation (dpERK) are depressed at dfmr1 null synapses. In contrast, the retrograde BMP ligand Glass bottom boat (Gbb) and downstream signaling via phosphorylation of the transcription factor MAD (pMAD) seem not to be affected. To determine whether HSPG upregulation is causative for synaptogenic defects, HSPGs were genetically reduced to control levels in the dfmr1 null background. HSPG correction restored both (1) Wg and Jeb trans-synaptic signaling, and (2) synaptic architecture and transmission strength back to wild-type levels. Taken together, these data suggest that FMRP negatively regulates HSPG co-receptors controlling trans-synaptic signaling during synaptogenesis, and that loss of this regulation causes synaptic structure and function defects characterizing the FXS disease state (Friedman, 2013). Two synaptic HSPGs are strongly upregulated in the absence of FMRP. Elevated abundance of the WNT ligand Wg in the synaptomatrix signaling domain. An increased ratio of HSPG co-receptor to Wg ligand depresses Fz2-C signaling. A second anterograde trans-synaptic pathway is depressed at dfmr1 null NMJs. Retrograde BMP signaling is not altered at dfmr1 null NMJs. Genetically reducing HSPG levels in dfmr1 nulls restores synaptic architecture. Genetically reducing HSPG levels in dfmr1 nulls restores synaptic function. Genetically reducing HSPG levels in dfmr1 nulls restores normal trans-synaptic signaling. FXS is widely considered a disease state arising from synaptic dysfunction, with pre- and postsynaptic defects well characterized in the Drosophila disease model. There has been much work documenting FXS phenotypes in humans as well as in animal models, but there has been less progress on mechanistic underpinnings. This study focuses on the extracellular synaptomatrix in FXS owing to identification of pharmacological and genetic interactions between FMRP and secreted MMPs, a mechanism that is conserved in mammals. Other studies have also highlighted the importance of the synaptomatrix in synaptogenesis, particularly the roles of membrane-anchored HSPGs as co-receptors regulating trans-synaptic signaling. Importantly, it has been shown that FMRP binds HSPG mRNAs, thereby presumably repressing translation. Based on these multiple lines of evidence, this study hypothesized that the FMRP-MMP-HSPG intersection provides a coordinate mechanism for the pre- and postsynaptic defects characterizing the FXS disease state, with trans-synaptic signaling orchestrating synapse maturation across the synaptic cleft (Friedman, 2013). In testing this hypothesis, a dramatic upregulation of GPI-anchored glypican Dlp and transmembrane Sdc HSPGs was discovered at dfmr1 null NMJ synapses. Indeed, these are among the largest synaptic molecular changes reported in the Drosophila FXS disease model. Importantly, HSPGs have been shown to play key roles in synaptic development. For example, the mammalian HSPG Agrin has long been known to regulate acetylcholine receptors, interconnected with a glycan network modulating trans-synaptic signaling. In Drosophila, Dlp, Sdc and Perlecan HSPGs mediate axon guidance, synapse formation and trans-synaptic signaling. Previous work on dlp mutants reports elevated neurotransmission, paradoxically similar to the Dlp overexpression phenotype shown in this study. However, the previous study does not show Dlp overexpression electrophysiological data, although it does show increased active zone areas consistent with strengthened neurotransmission. The same study reports that Dlp overexpression decreases bouton number on muscle 6/7, which differs from finding in this study of increased bouton number on muscle 4. Because HSPG co-receptors regulate trans-synaptic signaling, dfmr1 mutants were tested for changes in three established pathways at the Drosophila NMJ. Strong alterations in both Wg and Jeb pathways were found, with anterograde signaling being downregulated in both cases. In contrast, no change was found in the retrograde BMP Gbb pathway, suggesting that FMRP plays specific roles in modulating anterograde trans-synaptic signaling during synaptogenesis (Friedman, 2013). The defect in Jeb signaling seems to be simple to understand, with decreased synaptomatrix ligand abundance coupled to decreased dpERK nuclear localization. However, there is no known link to HSPG co-receptor regulation. It has been shown earlier that Jeb signaling is regulated by another synaptomatrix glycan mechanism, providing a clear precedent for this level of regulation. In contrast, the Wnt pathway exhibits an inverse relationship between Wg ligand abundance (elevated) and Fz2-C nuclear signaling (reduced). This apparent contradiction is explained by the dual activity of the Dlp co-receptor, which stabilizes extracellular Wg to retain it at the membrane, but also competes with the Fz2 receptor. This ‘exchange-factor mechanism’ is competitively dependent on the ratio of Dlp co-receptor to Fz2 receptor, with a higher ratio causing more Wg to be competed away from Fz2. Indeed, it has been demonstrated that the same elevated Wg surface retention couples to decreased downstream Fz2-C signaling in an independent HSPG regulative mechanism at the Drosophila NMJ. This study suggests that in the dfmr1 null synapse, highly elevated Dlp traps Wg, thereby preventing it from binding Fz2 to initiate signaling (Friedman, 2013). Dysregulation of the Wg nuclear import pathway (FNI) provides a plausible mechanism to explain synapse development defects underlying the FXS disease state, with established roles in activity-dependent modulation of synaptic morphogenesis and neurotransmission. FXS has long been associated with defects in activity-dependent architectural modulation, including postsynaptic spine formation, synapse pruning and functional plasticity. Although it is surely not the only player, aberrant Wg signaling could play a part in these deficiencies. Importantly, it has been shown that the FNI pathway is involved in shuttling large RNA granules out of the postsynaptic nucleus, providing a potential intersection with the FMRP RNA transport mechanism. However, the Wg FNI pathway is not the only Wnt signaling at the Drosophila NMJ, with other outputs including the canonical, divergent canonical and planar cell polarity pathways, which could be dysregulated in dfmr1 nulls. For example, a divergent canonical retrograde pathway proceeds through GSK3β (Shaggy) to alter microtubule assembly, and the FXS disease state is linked to dysregulated GSK3β and microtubule stability misregulation via Drosophila Futsch/mammalian MAP1B. Moreover, it has been shown that the secreted HSPG Perlecan (Drosophila Trol) regulates bidirectional Wnt signaling to affect Drosophila NMJ structure and/or function, via anterograde FNI and retrograde divergent canonical pathways. It is also important to note that previous studies show that a reduction in the FNI pathway, due to decreased Fz2-C trafficking to the nucleus, leads to decreased NMJ bouton number. Future work is needed to fully understand connections between FMRP, HSPGs, the multiple Wnt signaling pathways and the established defects in the synaptic microtubule cytoskeleton in the FXS disease state (Friedman, 2013). Adding to the complications of FXS trans-synaptic signaling regulation, it was shown that two trans-synaptic signaling pathways are suppressed in parallel: the Wg and Jeb pathways. Possibly even more promising for clinical relevance, it has been established that the Jeb signaling functions as a repressor of neurotransmission strength at the Drosophila NMJ, with jeb and alk mutants presenting increased evoked synaptic transmission. Consistently, loss of FMRP leads to increased EJC amplitudes, which could be due, at least partially, to misregulated Jeb-Alk signaling. Importantly, it has been shown that dfmr1 null neurotransmission defects are due to a combination of pre- and postsynaptic changes, and that there is a non-cell-autonomous requirement for FMRP in the regulation of functional changes in the synaptic vesicle (SV) cycle underlying neurotransmission strength. Additionally, jeb and alk mutants exhibit synaptic structural changes consistent with this FMRP interaction, including a larger NMJ area and synaptic bouton maturation defects, which are markedly similar to the structural overelaboration phenotypes of the FXS disease state. These data together suggest that altered Jeb-Alk trans-synaptic signaling plays a role in the synaptic dysfunction characterizing the dfmr1 null. The study proposes that Wg and Jeb signaling defects likely interact, in synergistic and/or antagonistic ways, to influence the combined pre- and postsynaptic alterations characterizing the FXS disease state (Friedman, 2013). Although trans-synaptic signaling pathways, and in particular both Wnt and Jeb-Alk pathways, have been proposed to be involved in the manifestation of a number of neurological disorders, this study provides the first evidence that aberrant trans-synaptic signaling is causally involved in an FXS disease model. The study proposes a mechanism in which FMRP acts to regulate trans-synaptic ligands by depressing expression of membrane-anchored HSPG co-receptors. HSPG overexpression alone is sufficient to cause both synaptic structure and function defects characterizing the FXS disease state. Increasing HSPG abundance in the postsynaptic cell is enough to increase the number of presynaptic branches and synaptic boutons, as well as elevate neurotransmission. Correlation with these well-established dfmr1 null synaptic phenotypes suggests that HSPG elevation could be a causal mechanism. Conclusively, reversing HSPG overexpression in the dfmr1 null is sufficient to correct Wnt and Jeb signaling, and to restore normal synaptic structure and function. Because there is no dosage compensation, HSPG heterozygosity offsets the elevation caused by loss of dfmr1. Correcting both Dlp and Sdc HSPGs in the dfmr1 background restores Wg and Jeb signaling to control levels. Correcting Dlp levels by itself restores synaptic architecture, but both Dlp and Sdc have to be corrected to restore normal neurotransmission in dfmr1 null synapses. Taken together, these results from the Drosophila FXS disease model provide exciting new insights into the mechanisms of synaptic phenotypes caused by the loss of FMRP, and promising avenues for new therapeutic treatment strategies (Friedman, 2013). Fragile X associated tremor/ataxia syndrome (FXTAS) is a late onset neurodegenerative disorder caused by aberrant expansion of CGG repeats in 5′ UTR of FMR1 gene. The elevated mRNA confers a toxic gain-of-function thought to be the critical event of pathogenesis. Expressing rCGG90 repeats of the human FMR1 5′UTR in Drosophila is sufficient to induce neurodegeneration. Rapamycin has been demonstrated to attenuate neurotoxicity by inducing autophagy in various animal models of neurodegenerative diseases. Surprisingly, this study observed that rapamycin exacerbates rCGG90-induced neurodegenerative phenotypes through an autophagy-independent mechanism. CGG90 expression levels of FXTAS flies exposed to rapamycin present no significant differences. It was further demonstrated that activation of the mammalian target of rapamycin (mTOR) signaling can suppress neurodegeneration of FXTAS. These findings indicate that rapamycin will exacerbate neurodegeneration, and that enhancing autophagy is insufficient to alleviate neurotoxicity in FXTAS. Moreover, these results suggest mTOR and its downstream molecules as new therapeutic targets for FXTAS by showing significant protection against neurodegeneration (Lin, 2013). Rapamycin cannot ameliorate but aggravates the neurodegenerative phenotypes in FXTAS Drosophila model. Rapamycin aggravates neurodegenerative phenotypes of FXTAS flies through an autophagy-independent mechanism. Activating mTOR can improve neurodegeneration in FXTAS. Rapamycin, a neutral macrolide with immunosuppressive properties, has been proven to extend lifespan and to have a protective effect in many neurodegenerative diseases through induction of autophagy. As rapamycin protects against neuron death, alleviates neurotoxicity, and reduces the formation of aggregates in experimental models of other neurodegenerative disorders, this study expected to see similar protective effects in FXTAS. Unfortunately, rapamycin did not ameliorate the neurodegenerative phenotypes of FXTAS in the Drosophila model and instead aggravated them. Recognized as an arbiter of neuronal survival and death decisions in many neurodegenerative diseases, autophagy is the most crucial cellular process involved in the clearance of redundant proteins and components. Activation of autophagy has been demonstrated to mitigate neurotoxicity by promoting degradation of mutant proteins. Nevertheless, intriguingly, it was shown that autophagy alone has no effect on altering neurodegenerative phenotypes of FXTAS. In a previous study, overexpression of histone deacetylase 6 (HDAC6) was shown to suppress CGG90 induced rough eye. Knockdown of autophagy by Atg12 RNAi has no effect on suppression of neurodegeneration by HDAC6, suggesting HDAC6 exerts protective effects by an autophagy-independent mechanism, which fits well with findings in this study (Lin, 2013). In most neurodegenerative diseases, which are triggered by formation of aggregates, rapamycin or autophagy is sufficient to decrease the accumulation of mutant proteins and improve neurodegenerative phenotypes. Unlike other neurodegenerative disorders, rapamycin treatment enhances neurodegeneration in FXTAS and activation of autophagy alone also proves to be ineffective at protecting against degeneration. These findings imply that FXTAS does not share the general pathogenic mechanism that aggregations of mutant proteins cause progressive neuronal dysfunction and loss. Therefore, this study speculates that FXTAS, caused by elevated levels of mRNA, possesses unique aspects compared with other neurodegenerative diseases. It's prerequisite to distinguish FXTAS from other neurodegenerative diseases with the similar symptoms clearly in the diagnostic procedure, especially other ataxia disorders. Importantly, treatment of those patients should be cautious unless accurately diagnosed as rapamycin, or its analogues, may possibly bring about an effect opposite to the one intended (Lin, 2013). Overexpression of fragile X premutation-length CGG repeats in mice or Drosophila can lead to pathological changes similar to patients, including FXTAS and fragile X-associated primary ovarian insufficiency (FXPOI). In FXPOI mice model, significant reductions of phosphorylated AKT and mTOR are observed in ovaries. Findings in this study definitely suggest that activating AKT/mTOR pathway can improve symptoms of FXTAS. Since both FXTAS and FXPOI result from toxicity of rCGG repeats, the study reasons that FXTAS and FXPOI share similar therapeutic intervention mechanisms and that, to some extent, the development of mTOR activators will be beneficial to them (Lin, 2013). In FXTAS patients, the neuropathological hallmark is the presence of eosinophilic and ubiquitin-positive intranuclear inclusions, in both neuronal and astrocytic nuclei, distributed throughout the cortex and brain stem. FMR1 mRNA and more than 20 protein components have been identified within the intranuclear inclusions. FMR1 mRNA arrests those RNA binding proteins (RBPs) within inclusions and prevents them from performing normal function, which is considered the principal cause of neurotoxicity. Activation of PI3K/AKT/mTOR signaling pathway has been proven to positively regulate expression of certain protein components in inclusions, such as myelin basic protein (MBP), 2′,3′-cyclic nucleotide 3′-phosphodiesterase (CNPase), vimentin, heterogeneous nuclear ribonucleoproteins (hnRNPs), glial fibrillary acidic protein (GFAP), HSP27 and HSP70. Since those intra-inclusions proteins are positively regulated by AKT/mTOR pathway, it's rational that activation of mTOR signaling exerts remission of neurodegenerative phenotypes through increasing protein synthesis. Additionally, αB-crystallin, a small heat shock protein also identified within the intranuclear inclusions of FXTAS, has been found to increase phosphorylation of AKT and mTOR, and to activate the PI3K/AKT/mTOR signaling pathway. Thus, the correlation between mTOR and protein components within conclusions needs to be further explored (Lin, 2013). Fragile X syndrome (FXS) is the most common form of inherited mental disability and known cause of autism. It is caused by loss of function for the RNA binding protein FMRP, which regulates several aspects of RNA metabolism including transport, stability and translation at synapses. FMRP has been implicated in neural stem cell proliferation and differentiation both in cultured neurospheres as well as in vivo mouse and fly models of FXS. It was previously shown that FMRP deficient Drosophila neuroblasts upregulate Cyclin E, prematurely exit quiescence, and overproliferate to generate on average 16% more neurons. This study further investigates FMRP's role during early development using the Drosophila larval brain as a model. Using tissue specific RNAi it was found that FMRP is required sequentially, first in neuroblasts and then in glia, to regulate exit from quiescence as measured by Cyclin E expression in the brain. Furthermore, the study tested the hypothesis that FMRP controls brain development by regulating the insulin signaling pathway, which regulates neuroblast exit from quiescence. Data indicate that phosphoAkt, a readout of insulin signaling, is upregulated in dFmr1 brains at the time when FMRP is required in glia for neuroblast reactivation. In addition, dFmr1 interacts genetically with dFoxO, a transcriptional regulator of insulin signaling. These results provide the first evidence that FMRP is required in vivo, in glia for neuroblast reactivation and suggest that it may do so by regulating the output of the insulin signaling pathway (Callan, 2012). FMRP is expressed in both neural stem cell and glial lineages in the developing larval brain. FMRP expression in neuroblasts is required for autonomous regulation of reactivation. FMRP expression in glia is required non-autonomously for neuroblast reactivation. Loss of FMRP results in ectopic pAkt expression in the developing brain. FMRP regulates the expression of pAkt in neuroblast lineages but not glia. Loss of FMRP suppresses the effect of reduced insulin signaling caused by dFoxO overexpression. FXS is a devastating neurodevelopmental disorder accompanied by severe cognitive deficits and autistic-like behaviors. Great strides have been made in elucidating the neurobiology of FXS, and the focus on FMRP's role in synaptic plasticity has uncovered new therapeutic strategies that are currently being translated into the clinic. These are based on elegant experiments performed in mouse and Drosophila models of FXS, which demonstrate the promise of group 1 mGluR antagonists in alleviating synaptic signaling as well as learning and memory deficits (Callan, 2012). Recent experiments report the presence of neural stem and progenitor cell defects in vitro as well as in vivo, both in mouse and fly models of FXS. While some differences exist among these different experimental systems, a common feature is that loss of FMRP leads to overproliferation and differentiation defects in neural stem and progenitor cells. Exciting recent experiments show that restoring FMRP activity in adult neural progenitors alone can rescue the learning and memory deficits associated with FXS in a mouse model. Also, loss of FMRP from neural stem cells during development in Drosophila leads to approximately 16% more neurons that persist in the adult brain and may contribute to aberrant circuit formation. The presence of supranumerary cortical neurons generated during early development has been linked to autism, raising the possibility that defects in neurogenesis may provide the basis for the overlap between FXS and autistic spectrum disorders. Thus, elucidating the role of FMRP in neural stem and progenitor cells during development therefore may hold great promise for a more complete understanding of the neurobiology of FXS and its autistic component in particular (Callan, 2012). It has been shown that FMRP is required for the proper timing of neuroblast reactivation, a highly conserved aspect of stem cell biology from insects to vertebrates. This study further investigates the mechanisms utilized by FMRP to regulate neuroblast reactivation during early brain development in a Drosophila model of FXS. A tissue specific RNAi approach was used to downregulate FMRP in either neuroblast lineages or glia. These experiments uncover a previously unknown role for FMRP in glia, regulating neuroblast re-entry into the cell cycle, as measured by increased Cyclin E expression. Furthermore, these results demonstrate that FMRP is required autonomously in neuroblasts and non-autonomously in glia, in a temporally controlled manner, to regulate neuroblast reactivation through both intrinsic and extrinsic signaling. The discovery of this developmental switch in FMRP's requirement first in neuroblasts, then in glia, underscores the power of genetics in elucidating the neurobiology of FXS using Drosophila as a model (Callan, 2012). Although there is a clear role for FMRP in the glia, its precise function in these cells remains poorly understood. It has been shown that FMRP is expressed in glia during embryonic development but appears downregulated postnatally in the mouse brain. Co-culture of glia and hippocampal neurons demonstrates that glial cells contribute to the neuroanatomical defects found in the Fragile X brain, albeit the factors responsible are yet to be identified. This study provides the first in vivo evidence for FMRP's requirement in glial cells, and future work will focus on using more restricted glial Gal4 drivers to dissect the contribution of different glial types to regulating neuroblast reactivation in the dFmr1 mutant brains (Callan, 2012). Several mRNA targets have been predicted or confirmed for FMRP. Given FMRP's complex tissue specific and temporal requirements during development it is likely that more remain to be identified and confirmed in vivo. Some clues as to the possible pathways and targets regulated by FMRP in the developing brain come from recent reports that glia can provide cues (in the form of secreted dILPs) to neighboring neuroblasts awaiting a reactivation signal. These findings together with data from this study showing that FMRP is required sequentially in neuroblasts, then in glia, for proper neuroblast reactivation suggest a model whereby FMRP may control the timing and/or levels of insulin signaling in the brain by acting in different tissues at different times during development. It was shown that indeed, at the time when FMRP is required in glia (12–18 h ALH), more cells belonging to neuroblast lineages express pAkt. Coupled with the genetic interaction between dFmr1 and dFoxO, a downstream effector as well as inhibitor of insulin signaling, the study suggests that FMRP controls neural stem cell behavior by directly regulating components of insulin signaling. Notably, PI3K, an upstream activator of Akt has been shown to be a target of FMRP in the context of mGluR signaling at synapses. Thus for its autonomous function in neuroblasts, FMRP could regulate PI3K directly, while later, in glia, for its nonautonomous function, FMRP could control (directly or indirectly) the expression of the dILPs secreted by glial cells. Notably, in vertebrates, Insulin Growth Factor-1 (IGF-1) and PI3K/Akt can also promote cell-cycle progression in neural stem cells, thus raising the possibility that findings in the fly model may be highly relevant to the molecular mechanisms underlying FXS. While more work is needed to elucidate FMRP's role in the communication between the glial niche and neuroblasts, it is tempting to speculate that FMRP may regulate similar signaling cassettes and molecules (i.e., PI3K) in different developmental contexts. The Drosophila model offers unique opportunities to dissect tissue specific regulation such as glial versus neuroblast specific mRNA targets in future experiments (Callan, 2012). Fragile X syndrome is caused by the loss of the FMR1 gene product, fragile X mental retardation protein (FMRP). The loss of FMRP leads to altered circadian rhythm behaviors in both mouse and Drosophila; however, the molecular mechanism behind this phenomenon remains elusive. This study performed a series of gene expression analyses, including of both mRNAs and microRNAs (miRNAs), and identified a number of mRNAs and miRNAs (miRNA-1 and miRNA-281) with circadian rhythm-dependent altered expression in dfmr1 mutant flies. Identification of these RNAs lays the foundation for future investigations of the molecular pathway(s) underlying the altered circadian rhythms associated with loss of dFmr1. (Callan, 2012). The loss of Fmrp does not alter the expression of circadian rhythm master genes. The loss of dFmr1 leads to circadian rhythm-dependent alteration of specific gene expression in Drosophila heads. The loss of dFmr1 leads to altered expression and biogenesis of miR-1 and miR-281. Consistent with the notion that FMRP is a translational regulator, this study did not detect any change of gene expression in a large number of genes at the mRNA level. Interestingly, a third of the mRNAs that are altered either at CT00 or CT12 display the change only at one time point, which reflects a circadian rhythm-dependent alteration. How these changes could contribute to the altered circadian rhythms through the loss of dFmr1 warrants further investigation. It is also possible that the observed changes could be a direct consequence of a defect in regular sleep pattern rather than a direct consequence of the molecular clock, which would need further investigation. It would also be interesting to test whether dFMR1 associates with these mRNAs in a circadian rhythm-dependent manner, which has not been explored before. Finally, the biological functions of most mRNAs we identified are still unknown, and it might prove fruitful to examine their roles in circadian rhythms in general, as well (Xu, 2012). Fragile X syndrome, the most common form of inherited mental retardation, is caused by the loss of the fragile X mental retardation protein (FMRP). FMRP is a ubiquitously expressed, multi-domain RNA-binding protein, but its in vivo function remains poorly understood. Earlier studies show that FMRP participates in cell cycle control during development. This study used Drosophila mutants to test if FMRP plays a role in DNA damage response under genotoxic stress. It was found that significantly fewer dfmr1 mutants survive to adulthood than wild-types following irradiation or exposure to chemical mutagens, demonstrating that the loss of Drosophila FMRP (dFMRP) results in hypersensitivity to genotoxic stress. Genotoxic stress significantly reduces mitotic cells in wild-type brains, indicating the activation of a DNA damage-induced G2/M checkpoint, while mitosis is only moderately suppressed in dfmr1 mutants. Elevated expression of cyclin B, a protein critical for the G2 to M transition, is observed in the larval brains of dfmr1 mutants. CycB mRNA transcripts are enriched in the dFMRP-containing complex, suggesting that dFMRP regulates DNA damage-induced G2/M checkpoint by repressing CycB mRNA translation. Reducing CycB dose by half in dfmr1 mutants rescues the defective G2/M checkpoint and reverses hypersensitivity to genotoxic stress. In addition, dfmr1 mutants exhibit more DNA breaks and elevate p53-dependent apoptosis following irradiation. Moreover, a loss-of-heterozygosity assay shows decreased irradiation-induced genome stability in dfmr1 mutants. Thus, dFMRP maintains genome stability under genotoxic stress and regulates the G2/M DNA damage checkpoint by suppressing CycB expression (Liu, 2012). dfmr1 mutants are hypersensitive to genotoxic stress. Defective G2/M checkpoint in dfmr1 mutants. Up-regulation of CycB expression in dfmr1 mutant brains. Reducing CycB partially rescues the G2/M checkpoint defect and reverses the hypersensitivity to irradiation in dfmr1 mutants. Ionizing radiation induces excessive p53-dependent apoptosis in dfmr1 mutants. Increased number of DNA breaks in the irradiated dfmr1 mutants. dfmr1 mutants exhibit increased genome instability induced by genotoxic stress. Phenotypic analysis of animal models of FXS continues to reveal novel functions for FMRP. This study presents multiple lines of experimental evidence demonstrating for the first time that dFMRP is involved in DNA damage response. DNA damage responses are executed through coordinated interplays and cross-talks of multiple players from sensors to transducers, and finally to effectors. There are four distinct pathways involved in the DNA damage response: cell cycle arrest (also known as DNA damage checkpoint), transcriptional induction, DNA repair and apoptosis; the four pathways act independently under certain conditions, but frequently, they interact to repair the damaged DNA or commit apoptosis. The hypersensitivity to irradiation, G2/M checkpoint defects, excessive apoptosis and increased number of DNA breaks in dfmr1 mutants after irradiation all support that dfmr1 plays a critical role in DNA damage response. In addition, dfmr1 mutants show an elevated rate of loss-of-heterozygosity (LOH) upon DNA damage, indicating reduced genome stability in dfmr1 mutants. It is well established that proteins involved in checkpoint control and DNA repair play a critical role in maintaining genome integrity. Thus, the decreased genome stability in dfmr1 mutants also supports the conclusion that dfmr1 participates in DNA damage response (Liu, 2012). Loss of dfmr1 affects cell cycle progression in different developmental processes. This study speculated that the hypersensitivity to DNA damage in dfmr1 mutants might be due to a defective cell cycle control. However, in the absence of genotoxic stress, normal expression of the G1/S checkpoint regulator CycE, normal DNA synthesis activity and normal G2/M checkpoint were detected in dfmr150M mutants compared with the wild-type. These results indicate that the G1/S and G2/M checkpoints are functional in dfmr1 mutants. Following genotoxic stress, however, significantly more mitotic cells were found in the larval brains and wing discs of dfmr150M mutants compared with the wild-type controls, indicating a defect in the G2/M DNA damage checkpoint in dfmr1 mutants. In support of this checkpoint defect, cell cycle profiling of the larval brain cells by flow cytometry demonstrates a similar trend of cell cycle profile between dfmr1 and mei-41 mutants. The study therefore concludes that dfmr1 primarily regulates the G2/M checkpoint in response to genotoxic stress (Liu, 2012). Cyclins and their CDK partners play an important role in regulating cell cycle progression. Misregulation of these cyclin–CDK complexes causes defective cell cycle progression, especially in the cells with damaged DNA. When DNA damage is inflicted at the G1 stage, the G1/S checkpoint regulator CycE–CDK2 is silenced to arrest the G1 to S transition. Alternatively, when DNA damage occurs at the G2 stage or if DNA damage remains unrepaired from the previous G1 or S phase, the CycB–CDK1 complex (also known as a mitosis promoting factor) is inhibited to arrest cells at the G2/M transition. In light of a report demonstrating that dFMRP suppresses the expression of CycB at the mid-blastula transition during early embryonic development, this study speculated that the G2/M checkpoint defect observed in dfmr1 mutants after genotoxic stress might be due to the altered expression of CycB. Indeed, CycB protein was found to be elevated in dfmr150M brains, while the other two G2/M checkpoint regulators, CycA and CycB3, were unaltered, indicating a specific suppression of CycB by dFMRP. This specific regulation of CycB by dFMRP is further supported by the observation that CycB mRNA is enriched in the dFMRP-mRNA protein complex from larval brains. Moreover, reducing the dose of CycB by half partially rescues the increased mitosis and hypersensitivity of dfmr1 mutants to genotoxic stress. Thus, up-regulation of CycB in dfmr1 mutants accounts, at least partially, for the G2/M checkpoint defect in response to DNA damage. In support of this conclusion, overexpression of the truncated, stable form of CycB is sufficient to induce G2/M transition defect in both eye discs and wing discs after irradiation (Liu, 2012). The CycB level is tightly regulated during the cell cycle at both the transcriptional and post-translational levels. Among the many regulators of CycB, the transcription factors NF-Y, FoxM1 and B-Myb activate transcription of CycB. These CycB regulators are important for the G2/M progression under both normal and stress conditions. Activation of FoxM1 is critical for the G2/M arrest, whereas B-Myb is required for the recovery of G2/M checkpoint in p53-negative cells. This study reveals a negative regulation of CycB by dFMRP at the post-transcriptional level that controls the G2/M checkpoint under genotoxic stress (Liu, 2012). In addition to the G2/M cell cycle defect in dfmr1 mutants, an obviously disrupted nucleolar structure in the mutant salivary gland cells was found. As the nucleolus is critical for the DNA damage-induced p53 activation and apoptosis, apoptosis in the wing discs was examined by anti-caspase-3 staining. Spontaneous apoptosis is undetectable in the untreated dfmr1 mutants and wild-types, while genotoxic stress evokes excessive p53-dependent apoptosis in dfmr1 mutants. Overactivation of p53 in the dfmr1 mutants was further confirmed by elevated expressions of the pro-apoptotic hid-rpr-grim genes transcriptionally regulated by p53. It is unknown at present why dfmr1 mutants show increased p53-dependent apoptosis after irradiation. One interpretation for the phenotype is compromised DNA damage repair in dfmr1 mutants. Alternatively, the increased level of CycB in dfmr1 mutants may also lead to elevated apoptosis. It is worth noting that without genotoxic stress, dfmr1 is required for apoptosis and clearance of developmentally transient neurons in the adult brains. On the other hand, overexpression of dFMRP in multiple tissues including the wings and eyes also induces apoptosis, though a possible role of p53 in the process was not examined. Thus, dFMRP can either promote or inhibit apoptosis under different conditions by distinct yet uncharacterized mechanisms (Liu, 2012). Drosophila dfmr1 null mutants also exhibit decreased genome stability as revealed by the LOH assay. Apoptosis is an endogenous and well conserved program to eliminate cells with severely damaged DNA to avoid propagation of potential mutations. It is conceivable that loss of dfmr1 decreases genome stability, presumably resulting from a DNA repair defect, leading to increased apoptosis and lethality following DNA damage. Further experiments are required to unravel the causal relationships between dFMRP, DNA repair and apoptosis (Liu, 2012). It is not known if FXS patients and Fmr1 knockout mice are also hypersensitive to genotoxic stress. It is well established that the fragile sites of chromosomes are more prone to DNA damage and thus more dependent on the integrity of DNA repair mechanisms to maintain chromosomal stability. A study using fibroblasts reported that the DNA damage response is required to maintain the stability of the fragile X site. In addition, mutagen-induced genome instability is observed in the cultured lymphocytes from FXS patients. However, a subsequent study reported that lymphocytes from FXS patients display normal genome stability under genotoxic stress. This discrepancy remains to be resolved. In Drosophila, there is only one FMRP homolog instead of three FMRP family members in mammals. The redundancy of three FMRP members in mammals may make the phenotype of single mutants too weak to be detected. It would be of interest to test if double or triple mouse knockouts of the three FMRP family members exhibit the hypersensitivity to genotoxic stress observed in the Drosophila dfmr1 mutants. Such a result would underscore a novel role for FMRP in maintaining genome stability and cell cycle control to allow for proper neuronal proliferation during brain development (Liu, 2012). Fragile X-associated tremor ataxia syndrome (FXTAS) results from a CGG repeat expansion in the 5′ UTR of FMR1. This repeat is thought to elicit toxicity as RNA, yet disease brains contain ubiquitin-positive neuronal inclusions, a pathologic hallmark of protein-mediated neurodegeneration. This study explains this paradox by demonstrating that CGG repeats trigger repeat-associated non-AUG-initiated (RAN) translation of a cryptic polyglycine-containing protein, FMRpolyG. FMRpolyG accumulates in ubiquitin-positive inclusions in Drosophila, cell culture, mouse disease models, and FXTAS patient brains. CGG RAN translation occurs in at least two of three possible reading frames at repeat sizes ranging from normal (25) to pathogenic (90), but inclusion formation only occurs with expanded repeats. In Drosophila, CGG repeat toxicity is suppressed by eliminating RAN translation and enhanced by increased polyglycine protein production. These studies expand the growing list of nucleotide repeat disorders in which RAN translation occurs and provide evidence that RAN translation contributes to neurodegeneration (Todd, 2013). Repeat-associated non-AUG-initiated translation and inclusion formation in a Drosophila model of FXTAS. RAN translation produces a polyglycine-containing protein in mammalian cells. RAN translation of polyglycine protein initiates 5′ to the CGG repeat. RAN translation also occurs in the alanine reading frame. The FMR1 5′ UTR is engaged with translating ribosomes. The FMR1 polyglycine protein is present in FXTAS patient brains. RAN translation of the polyglycine protein explains the difference in inclusion formation between two mouse models of FXTAS. Translation of the polyglycine protein contributes to CGG repeat toxicity in human cell Lines and Drosophila. This study demonstrates that RAN translation occurs in association with CGG repeats in the neurodegenerative disorder FXTAS, a disease previously thought to result primarily from RNA-mediated toxicity. These findings, along with other reports detailing unconventional translation through CAG repeats in spinocerebellar ataxia type 8 and myotonic dystrophy type I and GGGGCC repeats in C9orf72-associated ALS/FTLD, suggest that RAN translation is a shared pathogenic mechanism in many repeat expansion disorders. It was further demonstrated that production of one particular CGG RAN translation product in FXTAS, FMRpolyG, directly modulates CGG-associated pathology in two distinct model systems. First, the ability to generate the FMRpolyG protein explains a key pathologic discrepancy between two established knockin mouse models. Second, in Drosophila it was shown that CGG repeat-associated neurodegeneration is largely dependent on FMRpolyG production. These results suggest that RAN translation contributes to FXTAS pathogenesis and support an emerging view that nonexonic repetitive elements can trigger toxicity simultaneously as both RNA and protein (Todd, 2013). The mechanisms underlying RAN translation remain unclear. The unconventional translation described in this study appears to initiate predominantly at a near-AUG codon just 5′ proximal of the repeat. This finding suggests a model wherein a scanning 43S ribosomal preinitiation complex stalls at the CGG repeat, allowing for alternate usage of a near match at the initiation codon. This model is based on the observation that placing a stop codon just proximal to the repeat or shortening the 5′ leader before the repeat impairs RAN translation in this reading frame. In contrast, CGG RAN translation in the other two possible reading frames behaves differently. RAN translation product is not detected from the +0 (CGG, polyArginine) reading frame, and RAN translation in the +2 (GCG, polyAlanine) reading frame is less efficient, occurs when stop codons are inserted 5′ of the repeat, and demonstrates CGG repeat length dependence. Differences in the propensity for translational initiation in different reading frames have also been reported for RAN translation of expanded CAG repeats in SCA 8, in which the surrounding sequence appeared to be an important modulator. Thus, RAN translation may not result from a single mechanism. Rather, each repeat, and indeed each reading frame within each repeat, may have different contextual requirements. These differences notwithstanding, the fact that atypical translation has now been observed independently with four different nucleotide RNA repeats in cell lines, animal models, and human tissues suggests that it is a more widespread biological event than anticipated (Todd, 2013). An emerging question now is what roles do these translation initiation events play in normal physiology and in disease? Findings from this study support a significant role for the FMRpolyG protein in disease pathogenesis, given the evidence in Drosophila and mammalian cells of enhanced toxicity with increased polyglycine translation and lessened toxicity when translation is reduced. However, numerous published studies support a primary role for CGG RNA in toxicity, leading to the suggestion that, in FXTAS, additive or synergistic toxicity associated with both toxic RNA and toxic proteins may be critical to disease pathogenesis. Though this study focuses on FMRpolyG production, other CGG RAN translation-associated products such as the polyalanine protein can represent additional toxic species. Moreover, if RAN translation occurs with CCG repeats, then production of other homopolymeric proteins from the antisense transcript through the repeat can also be relevant. For all of these potentially toxic entities, it will be important to determine their relative production in patients and relative degree of toxicity in animal models to ascertain their roles in disease pathogenesis (Todd, 2013). CGG RAN translation may also play a normal physiological role in translational regulation of FMR1 mRNA. FMRP, the protein product of FMR1, critically regulates synaptic function and its loss leads to fragile X syndrome, a common cause of autism and mental retardation. FMR1 mRNA is rapidly translated at synapses in an activity-dependent manner, where it constrains local synaptic protein translation. This study's observations in transfected cells show that RAN translation can occur at normal repeat sizes, with initiation occurring within a narrow region just 5′ of the repeat. Analysis of ribosomal profiling data sets derived from samples with normal CGG repeat sizes demonstrates the presence of assembled ribosomes over these regions in both human and mouse cell lines. Intriguingly, the Drosophila homolog of FMRP, dfxr, is expressed as two isoforms, with the larger isoform initiating translation at a CUG codon upstream of the canonical TIS, indicating that aspects of this process may be evolutionarily conserved. Upstream ORFs are believed to suppress expression from downstream canonical ORFs. In the case of FMR1 mRNA, translation through the repeat may assist RNA unwinding via helicase recruitment, allowing normal scanning by trailing ribosomes and appropriate initiation at the canonical ORF. Alternatively, ribosomes translating through the repeat could terminate translation and reinitiate at the AUG of FMRP, or ribosomes could initiate downstream of the repeat via an internal ribosomal entry site (Todd, 2013). Variations on the RAN translation described in this study potentially could expand the percentage of the transcriptome encoding for protein, complicating the classical definitions by which we divide “coding” from “noncoding” RNA. Consistent with this, unbiased methods in yeast and mammalian cells reveal that thousands of transcripts initiate translation at non-AUG start sites, often creating upstream ORFs in sequences previously identified as 5′ UTR. Usage of these atypical upstream ORFs is responsive to changes in cell state and external stimuli. Mechanisms similar to those reported in this study may therefore have broader repercussions for the neuronal proteome and global translational regulation (Todd, 2013). Home page: The Interactive Fly © 2015 Thomas Brody, Ph.D.